I’ve been a busy beaver in the greenhouse lately. I’ve potted up some of my Canna Lily rhizomes (about 30 to be exact) and Elephant Ear corms (bulb-like structures) in starter pots and have sown some seeds to get growing. Some started germinating this week. And another activity has been cleaning and rearranging the growing spaces in my greenhouse so I can fit the planned attendees for my upcoming Seed Starting Sessions in two weeks. I decided to add a new date – a weeknight at 3 pm on Tuesday, March 26th, for those who can’t make Saturday’s session. All the details are on WorkshopsCT.com. These seed starting sessions are small groups and it is the first year I’m offering this as a hands-on learning workshop. Each attendee will learn everything I know to date about growing from seeds. There are so many little things to be aware of. You would think it is just as easy as plopping a seed into soil but there are at least 5 important things you need to know to succeed. We will go over these at the workshops and you will plant your own tray of 32 seeds! I also enjoy very much picking out unique varieties to grow. There is something amazing about the odd shape of an heirloom tomato and the interesting shapes of crinkly hot peppers, in addition to the plethora of amazing flavors of both. These are the goals of the types of plants we will sow at my seed starting sessions. The focus being on warm season vegetable, specifically tomato and pepper plants. It is important, if you are new to sowing seeds on your own, to start with a limited palate of choices – narrow down your plant types and practice growing them. It is very easy to get carried away and next thing you know, you have more starter plants than you know what to do with! Although giving some away to family and friends is truly rewarding. In my seed starting sessions, I plan to go over how to plan your sowing dates on the calendar and why it is important, to review why I select the types of seeds I do – and how you should go about selecting your own seeds. We will discuss what the various terms mean and why they are important (e.g., open pollinated, hybrids, and heirlooms ). And of course, we will go over soil types, how to water, and potential mistakes people make when sowing seeds. Then the best part is they will germinate in my greenhouse or you may take your tray home to oversee. When ready to be planted outdoors, you will be ready with a nice variety of plants you grew yourself. In addition, we will go over how to store seed and what mixes to use and why. And then of course, review what causes things to fail. If you have tried to grow seeds and had issues, this is a place to learn more, and these sessions are for beginners. Practice makes perfect in the seed sowing world. It is not always full proof but know what and how to sow really increases your chances of success. The dates are March 23rd, Saturday (2 sessions available, 10 am or 1 pm) and March 26th, Tuesday (1 session available at 3 pm). In April, we have a monitoring session and you will be required to pick up your trays in late April or sooner if you wish. Registration and payment required in advance. See WorkshopsCT.com for details and links. I want a variety (more choices) and know that buying transplants won’t offer special unique types of plants available by seed sources. I want to feel reassured it is grown organically and is free of GMO issues. I want to save some money (buying transplants is more expensive and I can get many plants from seed sowing instead). Because I know the seedling will be monitored in the greenhouse and I don’t have the space at home. I have a hobby greenhouse or wish to get one, and want to learn what may be needed. Because I attempted growing them before and failed, and I’m not sure why. Because growing from seeds is satisfying and the rewards of fresh food are great. Maybe you want to grow plants from seeds because you want to teach the value of fresh food to your children or future generations. Perhaps you are a new homeowner and want to start a small garden. There are countless reasons why. Or perhaps you are a plant addict like me, and you just can’t stop yourself from having more plants in your surroundings. Just the act of sowing seeds is therapeutic and takes you away from the technology induced anxiety of social media. Whatever the reason, I hope you sign up soon. We had a great time at my workshop last Saturday – and we didn’t get rained on, thankfully! But, if you missed our session, there is another opportunity to join us on Saturday, May 20th, 10 am at Strong Family Farm in Vernon, CT on West Street. As noted on www.WORKSHOPSCT.com, where you may read all the details, our plant theme this year is indoor air purifiers and flashy fancy foliage houseplant style! Don’t let that word “houseplant” fool you – the design arrangements you may create at this workshop are GORGEOUS and at a great value. Get them while they are hot! My workshops are set-up so you have everything needed at your finger tips – you show up and have all the fun. You only need to bring your pots – and, this year’s pots are smaller to medium sizes because of the type of plants which we are using in this year’s theme (10″-12″-15″ in diameter and depth not deeper than width). 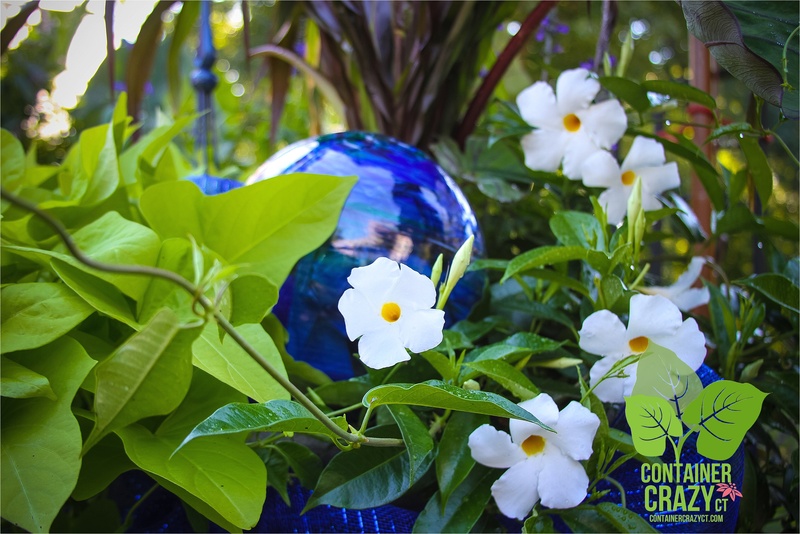 Get creative – someone brought a soup tureen last weekend, which made a wonderful centerpiece with these plants. The pots should have drain holes or we will drill them for you. There are many types of pots you may use. Just take a look at my Instagram feed or Container Crazy CT page for inspiration. This is one of the few historic farms standing in the Vernon area. You can feel the history’s energy when there. A portion of your registration fee ($20) is donated to the farm to help support their renovations and events. The morning will be a great creative day where you learn a lot about soil types on the market (I know they can be confusing! ), various fertilizers, tips for success at growing and maintaining plants in your patio pots and container gardens, and more. I hope you will join us. Handouts for reference are provided for all attendees. Again, these are low-light, bright-light, (shade or dappled sun outdoors) type of plants, and we have some flowering candidates too, along with started elephant ears – and all are foliage fantastical in my book. Lots of texture in these designs. Plus many of these tropical style houseplants do wonderfully in our summers outdoor here. We also have a stock of mixed succulents if you prefer to create a sun loving design with these perfect drought tolerant candidates. $20 to register plus cost of plants you select at the workshop. You may purchase professional soil mix at the workshop or bring your own bag. We will have other amendments available for purchase as well. CT Sales Tax applicable. You may text me at 860-977-9473 if you want in. If you prefer to prepay by credit card, please visit www.WORKSHOPSCT.com site to pay online via EventBrite. Or email me if preferred to indicate your interest in joining us. We’d love to have you do so. 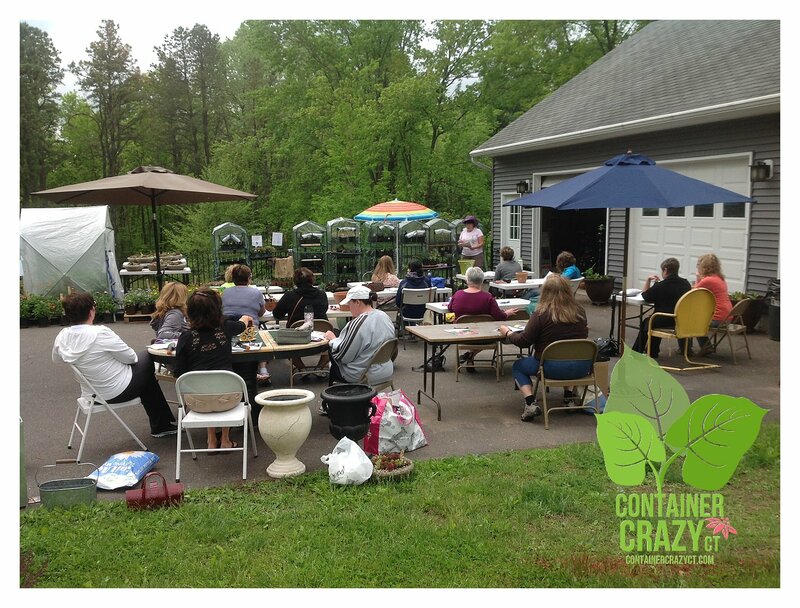 It is a big thrill for me when a container gardening workshop attendee shoots over a photo of how their container garden is doing since assembly at Container Crazy CT’s May Workshops. Sometimes, they will post a picture on Facebook for me, or I may happen to be visiting them at their home this summer, which was the case with friend and relative, Renee, on Saturday for her 4th of July event. The very first thing I saw was her big pot on her driveway situated between the garage doors, and it looks amazing! Just look at how all the textures and contrasts are working in this arrangement – I love this type of look. It is dramatic, lush, and showy. I was especially happy to see it doing so well because on her way home from the workshop, she texted me to say she made it almost all the way home, but took a corner and her pot fell over in her car! Of course, mental note – make sure every attendee secures their big pot in the future before they head out the driveway. We don’t want that to ever happen again. Although I offered some replacements, Renee decided to take the ‘wait and see’ approach – and well, it paid off! First of all, her Cardoon plant, well, just look at it! It is doing very well – and this plant isn’t always easy to grow. It is a plant hardy to Zones 7-11 and loves full sun, and because the foliage is serrated and has silver to gray green prickly stems, it adds that amazing texture. I grew one of these in a urn by itself one year, and it was dramatic because it arched over the edges and stood tall at the same time. So it does well solo too. This plant will sometimes move its leaves up in a praying motion at night. It can grow to six feet tall. Imaging it praying in the evenings. I am very happy Renee did well with it – and she noted, the prickly stems have gotten her from time to time when watering. She did watch the plant and saw insects at one point, but she kept on it with organic pray and it was resolved. This fountain grass, hardy to Zones 8-11, is one of the darkest around, and largest. It grows up to 54″ tall, but what I really really love is how it contrasts with the Cardoon’s silvery ghost like color and texture. Fine next to coarse, remember that rule, attendees?! Great example. Renee picked the right type of candidates to go together. This fountain grass is a full sun to part sun lover and deer resistant should you have deer in your yard, which I doubt would here but it is good to know. I’m glad I had these offered at the May Workshops on Container Gardening. I always like to add new candidates to the plant list for the workshops, and this one was new to me. Selected because of its dark color – useful for designs and adding contrast – but also because it seemed interesting for flavor – and has aromatic foliage. It grows quickly, but one gardener warned me, it can pop-up in your garden beds if used in the garden – which I did not know. It is native to the Himalayas to Southeast Asia and a relative to Basil and Coleus. 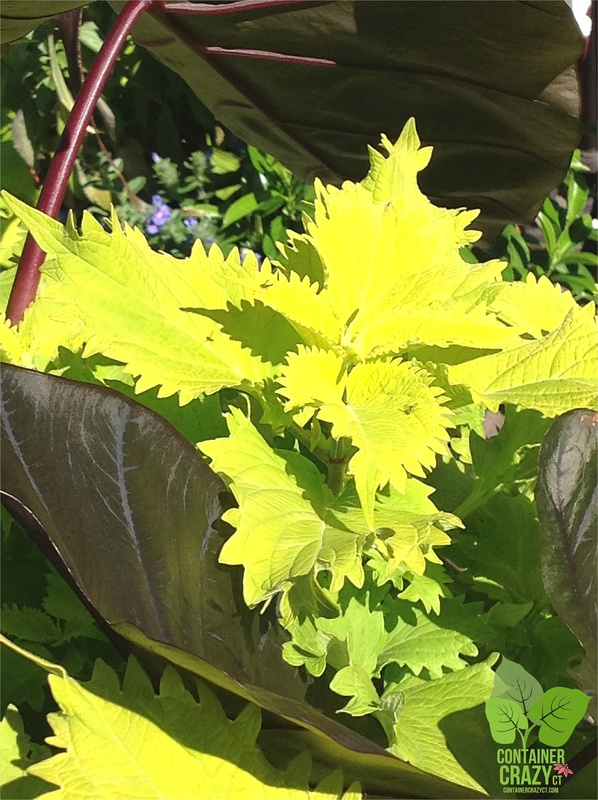 When you see how large the leaves grow – it doesn’t surprise me it is related to Coleus. But what this plant accomplished in Renee’s design is the repeating and echoing of a dark tones from the fountain grass. Well-done. Tucked in the right corner showing some of the green colors is a scented Geranium, called ‘Lemon Fizz’ – and it is amazing when you touch the leaves, it really gives off a lemon scent. It will bloom pretty pink flowers soon. Because our workshop included edibles and medicinal plants – this was a nice touch – because, in my opinion, anytime you smell a wonderful scent – it IS therapeutic. Also, another attendee, Joyce, sent a photo (above) and said she loves her pot and all was going well, along with Kathy, who sent a photo of her face next to a red banana leaf with a photo of her pot as well. Love seeing when the plants are looking healthy with no issues. Joyce kept saying at the workshop – “I don’t know what I’m doing.” – Well, I think she did cause just look at it. I remember insisting she add “slow release fertilizer” because she wanted to skip this step at first even though we had discussed the whys during my presentation, but I bet she is glad now she did that step. She also included the Pennisetum ‘First Knight’ – I like how it intermingles between the other plants in her big pot. 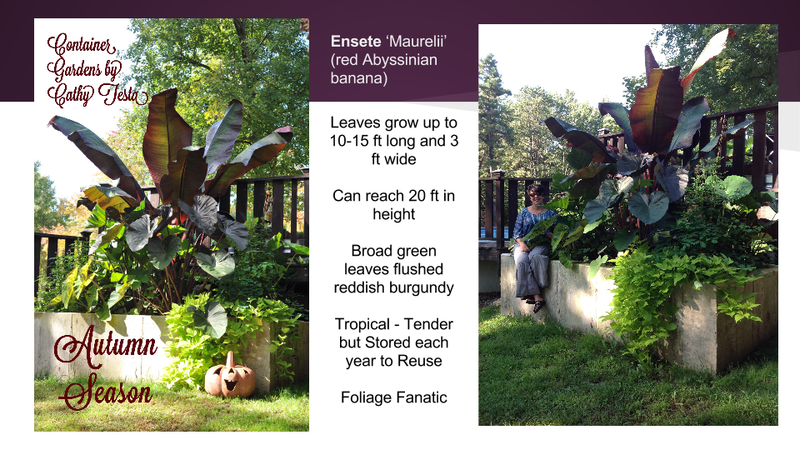 Both of them used the red banana plant (Ensete ventricosum ‘Maurelii’) for Zones 9-10 which is very showy. By the end of summer, it will be probably 3 times the size it is now! And these plants may be overwintered to reuse each season, shown in my fall workshop (see list below). Kathy, shown above, is very happy with her red banana plant, and she also purchased a couple Bajoo (green) banana plants and put them in her front bed – she said all are doing very well. Kathy is an experienced gardener and has that “green thumb” in my opinion – I am not surprised she is taking good care of her candidates at home. However, there were some people with some plant issues. Unfortunately, the Nicotiana (Flowering Tobacco) with star like deep purple flowers, got a particular bug problem on a few people’s plants, so I advised them to cut it down completely leaving just the base – and I witnessed one attendee’s a few weeks after this cutting back – it grew back beautifully, so that worked, however, I think I’ll skip that plant in the future. It tended to topple a bit as it got larger in addition to getting an insect problem on some. Plus, the flowers when spent, stick to the plant and requiring a bit of grooming. Also, some people had concerns with their red banana plant. We did have cool nights there for a while which these tropical plants don’t enjoy cool that much, and I thought, this could be why they didn’t perform well in some cases, but I am not totally sure. It also could be watering routines (over or under watering) – or even winds – which it is natural for a banana plant leaves to tear in wind. This happens in the tropics during rainstorms, etc. If the plant was neglected from not enough watering, it can get stressed and not recovery quickly. I usually don’t experience many problems with the red bananas however, so I was a little stumped as to why some did very well, and others struggled. Always something to learn about and investigate. The leaves of the red banana plants should not be fully yellow or suffering too much now with our warm temps. I recommend, if you are still having an issue with this plant, give it a boost of liquid fertilizer. Call me with questions if you have concerns. We can go over what to do next, but I am hopefully they are doing better by now. Other than these two plants of the many we had available at the workshops, I think everyone seems happy, so that is great news. I care on how your plants do – so let me know, or send a pic! Additionally, it is not uncommon to see aphids or other troublesome insects this time of year – so scout your plants, look at the under sides of the leaves too if you see any holes or damage, or even tap the leaves, to see if any bugs fall out. This is a way to check them. Up next is the East Windsor Farmers Market at the Trolley Museum off Rt. 140. This market is growing – try to pop in. As usual, I plan to give a free talk on container gardening tips. 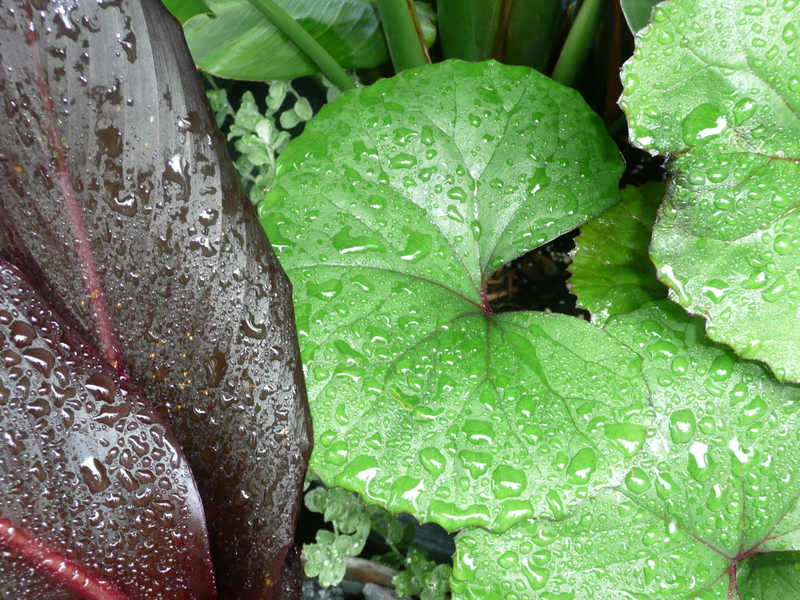 I will have lots of elephant ears (Colocasias ‘Blue Hawaii’, ‘Diamond Head’, ‘Maui Magic’, and ‘Black Magic’ cultivars), succulents (Hens and Chicks), Delospermas, and still have beautiful herbs, such as Greek Oregano. The prices will be reduced as well. Additionally, I plan to bring my beautiful hanging baskets of Begonias (‘Gryphon’ and ‘Dragon Wing Pink’). Hope to see you there on Sunday. I attended this market for the first time – and wow, I met some wonderful local people – so I will be back on Tuesday of next week. This market is held on a weekday which is a nice option. Many people pop in after work to get some fresh veggies for dinner. It is held in the back area of the town’s library off Main Street. If you see a dancing carrot – That is the market master waving people over. You won’t see the tents from the road, so drive into the library, and look for us by the back parking lot. Last week, free yoga was offered – how nice! They have fresh veggies, nice candle products with oils, local honey, and more. We have 3 new workshops on the horizon. 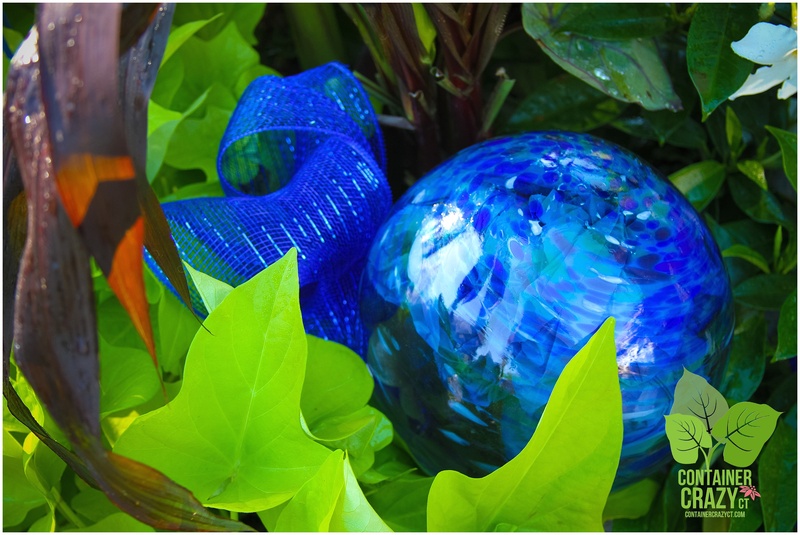 The Glass Garden Art Workshop with Laura Sinsigallo of timefliesbylauralie – We will be using wine bottles! Then after this – we are offering a Succulent Arrangement Workshop in October, followed by a new workshop on Growing Nutritious Soil Spouts in early November! Be sure to check them all out via our new blogsite called, www.WORKSHOPSCT.com, where you may register online if interested and will find all the details. We hope you will join us. Everyone is kicked into summer activities by now – including me – Don’t let it slip away without making sure to enjoy every moment possible. I know this – I enjoy summer more “BECAUSE OF” my plants and container gardens on my deck. I love sitting among my potted plants and admiring all as I read a mag after taking a dip in the pool, or hanging with friends. Watering is even more critical now because of our heat wave this week, and because – well, it is summer. Tomatoe plants drink a lot of water, so if you potted some up in May, be sure to check them in the afternoon after watering in the mornings. If dry, give them more! Also, remember, let soil dry a bit between watering. Don’t water-log your containers, but watch the plants. If they are limpy looking by day’s end – they may be crying for moisture. My ‘Patio Snacker’ Cucumber plant, which all sold in May at my workshops and farmers market offerings, is doing fantastic in my big pot (22″ in diameter) on the deck. Of course, I kept one plant for myself – It grows a new cucumber every other day or so now – LOVE it. It is perfect for pots – and I think that will be a keeper on my plant ordering list. Also, my tomato plant in a pot is going gangbusters. I planted the ‘Juliet’ which small plum shaped tomatoes in clusters on the branches. There are lots of tomatoes on it right now in the green stages – I can’t wait to see them ripen. I sold several varieties of tomato plants in May, and I hope your’s is doing well also. If want to see photos of these, search Container Crazy CT on Facebook to find me or click the links on this blog to your right. P.S. See my Pinterest boards on Plant Care – Important this time of year, there are many tips there. It is the day after Container Crazy CT’s first container gardening workshop of the season and I’m excited to announced our Container Design Challenge Winner. There are several reasons why Stacey’s design was selected as the prize winner. First, she used a different technique to structure her design than the typical T-S-F discussed in class, where she put her big Ensete (red banana plant) thriller to the back side rather in the center of the pot. Second, she correctly divided a perennial which had a densely packed root system, as we also discussed during our presentation on things you should do with plants which are girdled or densely packed before planting them into your container gardens. Additionally, she selected varied heights of her plants for balance, such as the perennial which will also bloom later in the season, and she incorporated different textures. Stacey also added what I would say fits the “chiller” plant category also discussed in our workshop – The Oscularia deltoides. This new succulent definitely captures visual interest and has the additional advantage of serving as a ‘spiller’ when it will reach out over the pot’s edge as it grows. Also, the chiller echoes the colors of the Coleus via it’s stems, AND echoes the colors of the base of her pot. And another bonus – Stacey’s pot was the “perfect size” – large enough based on my recommendations on sizes, and also beautiful. She mentioned to me how she drilled her drainage holes in other pots at home and even gave me a tip on how to handle urns which can be tricky to add drainage holes to. As I’ve said before – My attendees become experts and I start getting jealous of them – Great job Stacey! Your prize is a terrarium – Contact me for pick-up! You may select one with a cow, rabbit, or cat decor. They are a $40 dollar value. Everyone does amazing jobs with their selections of plants for their container gardens – but we want to mention Ashley’s herb drawer. She was on a mission to create an herbal mix – and she added creative touches into her adorable herbal drawer. She brought along kitchen utensils and marked the herbs’ names on them and inserted them into the soil. By the way, my assistant, Amelie, whispered to me, “Ashley’s Mom is going to win.” – because her Mom, Wendy, incorporated butterfly decor in her pots, so Wendy, just want to let you know, Amelie was voting for you. Speaking of assistants, I’d like to thank my husband, Steve. He worked in the yard before everyone arrived, then he assisted with carrying bags of soils, pots, and handled drilling. He went above and beyond – would you believe after everyone left – he had the energy to put away all the tables, chairs, and patio umbrellas which he also had put out early in the morning. Not sure where he got all that gusto but I can tell you this – he passed out on the couch the minute he put his feet up. Steve advises Joyce on the checkout procedure. Apparently, we may have a dip in temps – AGAIN! Wow, this spring is an odd one – so my advice is watch the weather forecast, and if it gets low, down to the low 4o’s or below – either move the pot to a sheltered place if possible, or very carefully cover the plants with a “light” bed type sheet – use poles to create a tee-pee if necessary. Remove the sheet as soon as the sun is up the next day. This is important for the tropicals in particular. Perennials are fine, and some annuals, but use caution. I hope after this last dip – we can relax and let our container gardens grow. Also, everyone was told to water in their containers as soon as they got home. Tomorrow, Mandy Mayer from JEM’s Horticulture and Floral Design and I (from you know where) will be at the small bookstore located on 100 Main Street in Broad Brook from 10 am to 1 pm for the store’s special event. She and I have been invited to attend their “Artisans and Authors” day, and we both will have some special items available for purchase and information for you about our upcoming events. There will be flower bouquets, individually stemmed roses, mini succulent cone bouquets, garden journals, and of course – many books and other vendors. “BOOK CLUB Bookstore and More” is located across from the Broad Brook pond (where a rare goose was sighted recently – don’t know the name of the goose, but pro photographers with very large camera lenses and tri-pod stands were gathered by the pond recently trying to capture a shot of it). It also is situated next door to the “At The Dam” restaurant. We are pleased to be participating and hope you will pop in to visit, despite the frightening cold weather the forecasters are predicting for tomorrow. A great game plan would be to bundle up, go have breakfast or lunch next door, and visit us. Mandy will be offering her beautiful floral arrangements – perfect for any one you wish to honor on Valentine’s Day – which is Sunday, but take note – she has a limited supply so don’t delay. She will have stemmed roses and other flowers for sale also. I will be selling adorable mini succulent bouquets, garden journals, and “Bert’s Birdhouses” which are made by my father with reclaimed wood. They are sturdy and made with care, and will help our feathered friends now and in spring time. Speaking of birds, an interesting thing happened to me yesterday. I was heading home, and I, of course, looked at my iPhone (when at a stop light! ), and saw an alert for a woman out in the cold with no coat. She walked away from Park Hill in Broad Brook which is a living center and the East Windsor police noted she has Alzheimer’s disease. Instead of pulling into my driveway, I drove around town looking. Around the back of the church, down again towards Main Street, I glanced to see if there were foot prints in the snow and then I saw the East Windsor Police walking out of “At the Dam” restaurant, so I pulled in and thought, I’ll snap photos of the bookstore while here and I was relieved to see they were going place to place in search of the missing woman. When I got home, I saw a woodpecker sitting on the snow by my kitchen door slider outside. As I opened the door, my cat jumped out – but I picked her back up, put her inside, and got my iPhone. Right then – he jumped onto my leg and clung on. I was shocked, and wow, what an experience. He obviously hit the glass window of the slider door, and was still coming out of his own shock of hitting the window. With iPhone in hand, I took a few photos and a quick video. To feel those clawed feet attached to my jeans was interesting. They are stronger than you think. He was blinking his eyes, and turning his head, but he didn’t leave immediately. He hung on for a bit – probably warming up as well. Suddenly, he hopped up at bit higher on my leg – which startled me. So with a few quick shakes of my leg, he flew off and landed on a deck railing to rest some more. As I posted the photos on Facebook and Instagram, some people said it is a sign. My sister said, it is a sign you did a good deed by trying to find that woman. And, one friend posted, that woman is my Aunt and she’s been located. Fortunately, she was found quickly and all was good. And the bird was fine too. I guess he thought my leg made a good stump. This week has been a busy yet productive one for me – I did a presentation on Wednesday night to a welcoming group from the “Down to Earth” garden club and library visitors at the South Windsor Public Library on Sullivan Avenue. After my presentation on “Container Gardening How To’s for Growth Success,” the club emailed me indicating they would like me back next year. She stated that they liked how I had something for the new, beginning, and seasoned gardener. This was nice to read on my laptop screen. The library is a great venue for the club – it is very large. It was the first time I stepped foot in there – and thought, I need to get out more. They offer all kinds of seminars and I saw a great deal of kids hanging out in one area. Pairing up the club with a library is a smart idea because you meet new people in the library too. There were new gardeners in the audience as well as seasoned garden club members. I enjoyed meeting all of them. The rest of my week has been preparing the Valentine’s Day themed items for Saturday. I thought, how lucky am I? I love adorning these things with red themes for the day. I always had a love of Valentine’s Day and the colors and artistic nature of the little gifts and cards. As a kid – I really liked picking out the little decorative cards, and sharing them with class mates – remember those days? Also, sending a Valetine’s Day greeting card to my parents for this day is something I’ve always done. Valentine’s Day is not “just for lovers” but for those you love as well. My desire is to meet you and new friends, so we hope you will stop by on your travels through town. There will be other artisans and authors there to meet and greet as well. 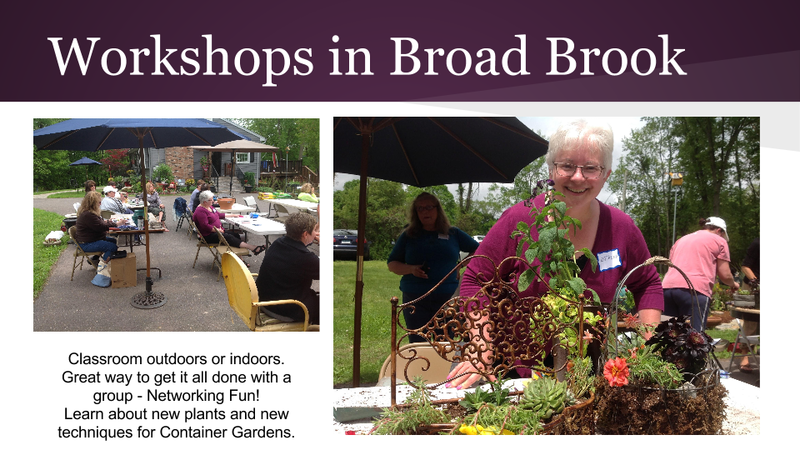 Container Gardening Workshops in Broad Brook, CT – In Three Weeks! Do you dream of lush, full, flower abundant container gardens on your patio, deck, surrounding your pool, or gracing the front steps of your home? 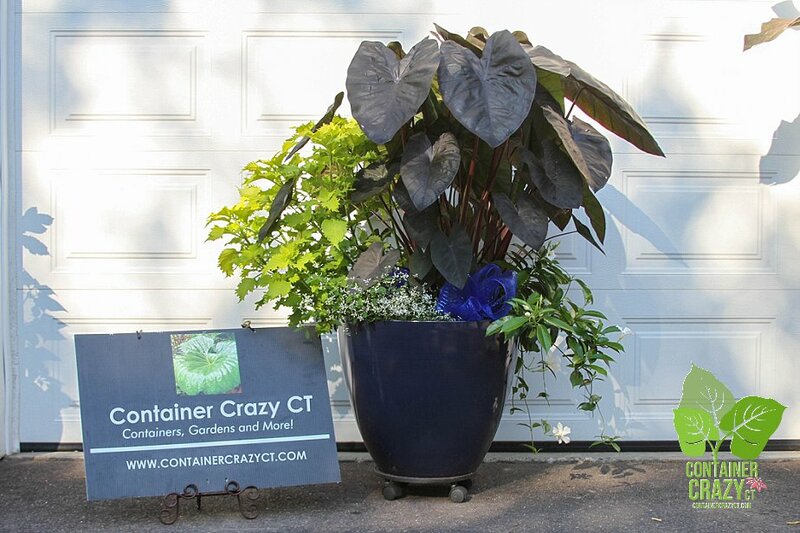 If yes, then Container Crazy CT’s Container Gardening Workshops are for you! Learn from a professional designer about the steps for success in designing and maintaining beautiful container gardens and patio pots at this workshop and take home your creations. This is a fun hands-on event that everyone will find informational and convenient. So popular in fact, each May, it fills up quickly – so don’t delay – fill out the Contact Form below to sign up. Many plants will be available at the workshop held in Broad Brook, Connecticut for you to select from. 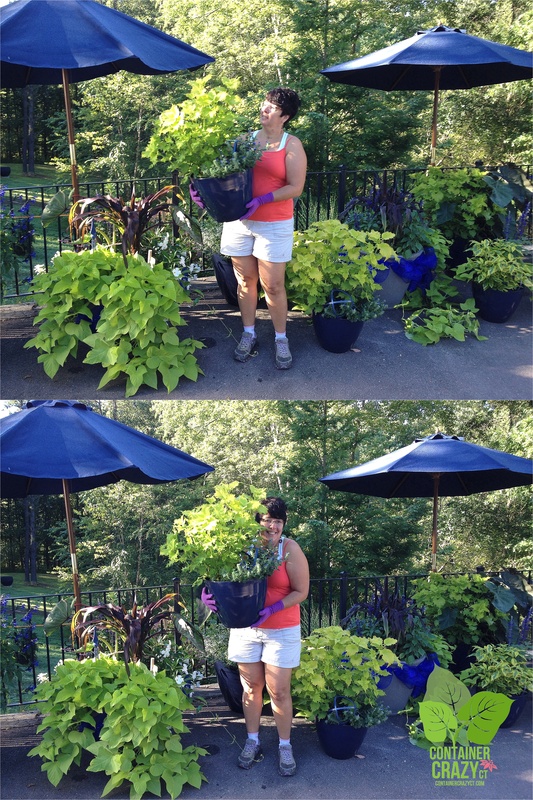 Cathy T of Container Crazy CT uses reputable nurseries and local growers that offer quality plants, plus she has an eye for selecting ‘wow’ plants suited for stunning color and textural combinations. The design process demonstrated during this event will be based on a theme of using ‘powerful perennials’ and ‘showy tropical plants’ this year. A large variety of perennials and tropical plants will be available for purchase and each attendee will be provided with detailed instructions and reference documentation for continued care of their plants. The right soil mix specifically for container gardens and patio pots will be available for purchase so you don’t have to carry a thing but your beautiful container garden and patio pots ready to be filled with plant selections. And don’t worry, if your pot is too big to carry when you are done, we have delivery services available via a protected trailer. You only need to bring yourself, a container(s) of your choice, and gardening gloves! It’s that easy. As noted above, you have two choices: May 16th or May 23rd. Only $15 per person + plus the cost of plants purchased at the class (and applicable sales tax). 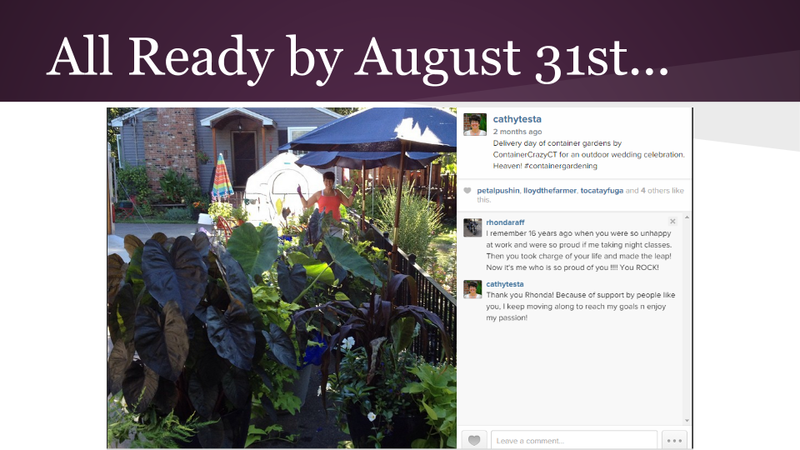 Payment is mailed to Cathy T’s Landscape Designs to confirm your seat. Address is provided upon registration. Note: Cancellations 4 days prior to the class dates are non-refundable, or you may send an alternate. For more details, visit the menu’s above, or click these links below, and stay tuned. Once registered, you receive additional details with your workshop confirmation. Perennials, which return year after year in your gardens (or more technically stated, are a plant that normally survives for three or more seasons), are excellent candidates in container gardens and patio pots. 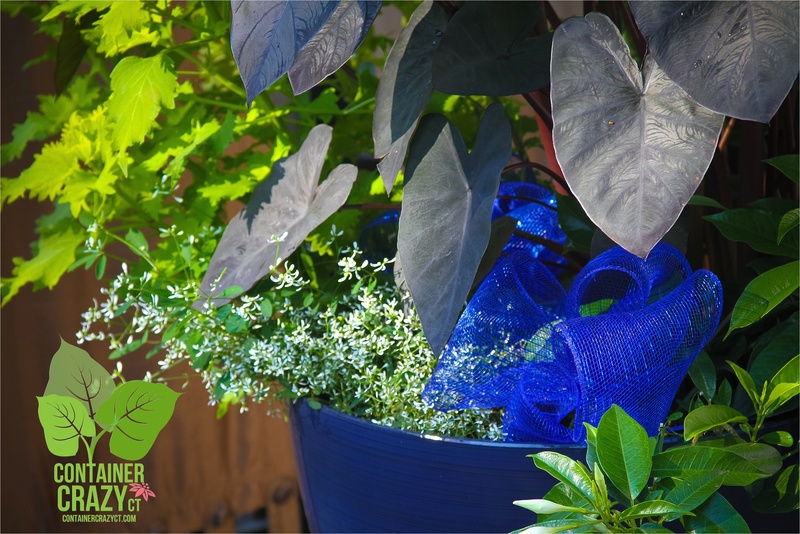 However, they are often overlooked for this use and many people do not understand their amazing benefits in container gardens or know which to select to achieve stunning combinations to make your container gardens look amazing in your outdoor surroundings! 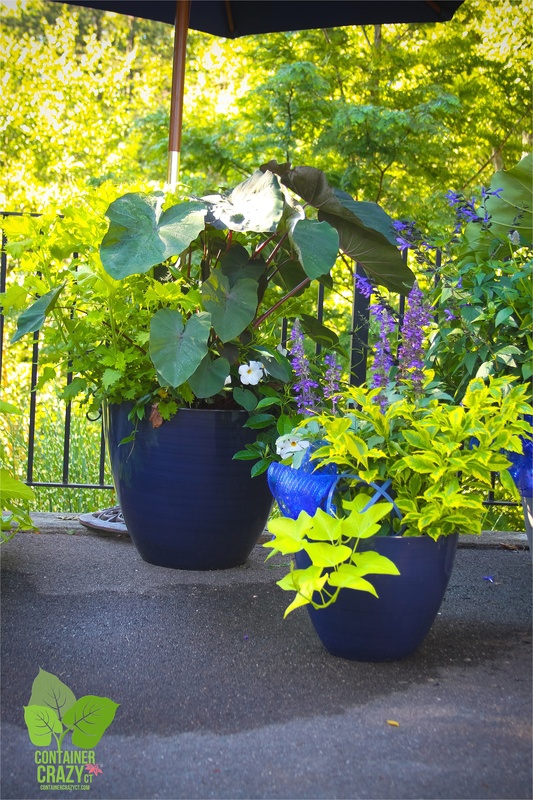 This year’s Container Garden Workshops hosted by Cathy Testa of Container Crazy CT in Broad Brook, CT will focus on perennials which perform beautifully in container gardens and patio pots, and how and why you should use them to your advantage. Container Garden with Mix of Perennials and Annuals Upon Planting! We all love color – and know many annual plants provide constant color in your container gardens, but so do perennials. Many perennials bloom at specific times during the season so they add a dynamic element to your containers. Some are short bloomers for a period of weeks, while other are long lasting for several months – It is a matter of knowing which perform best to maximize their show in your container gardens. Think of perennials as providing a burst of color at the right times to compliment the other mix of plants in your container gardens and patio pots. 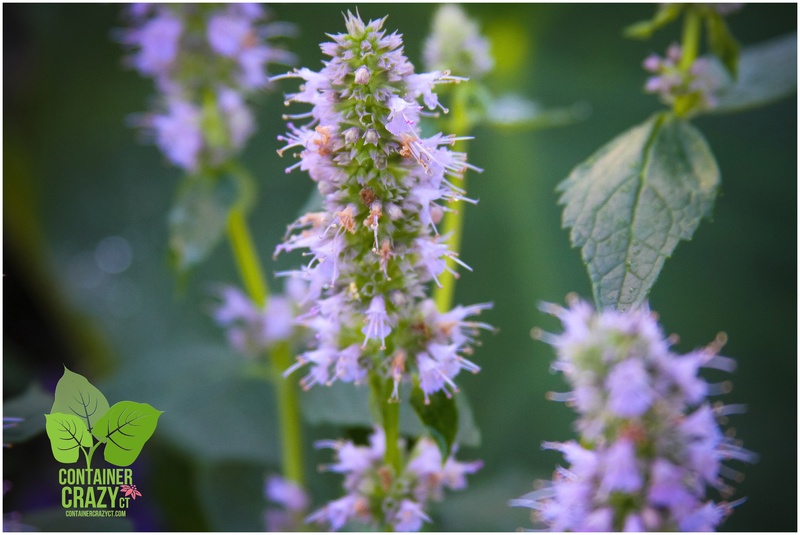 For example, a blue flowering perennial, called Agastache ‘Blue Fortune’, which also goes by the common name of anise hyssop, has a very long lasting soft blue flowers in summer. The blooms start in July and continue blooming all the way into September. 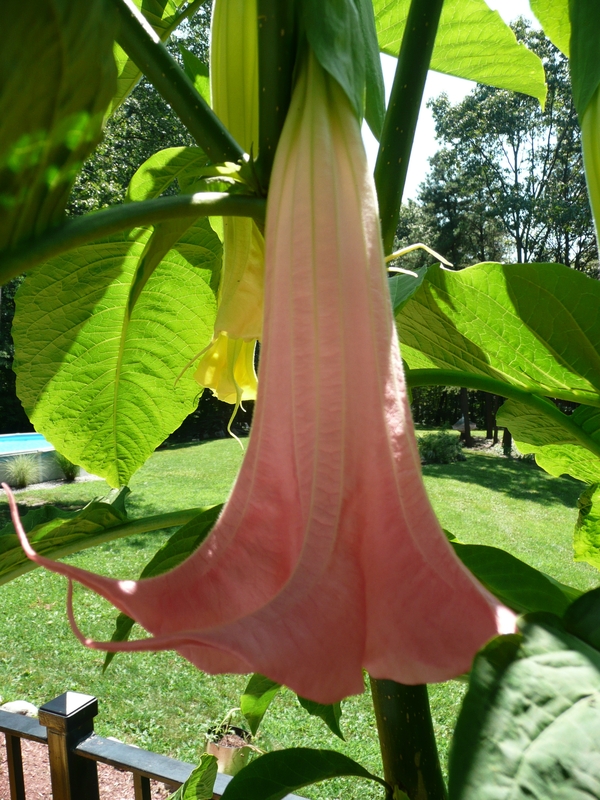 Not only is that long-lasting, if you find the blooms look tired towards the end of the summer, you only have to snip them off from the tall stems of the plant, and guess what? Within two weeks, you will see new fresh buds forming and opening up on your plant in the container garden. Perennials don’t peter out as quickly as annuals because most do not profusely bloom during the entire summer which takes lots of energy, and they have reserves from previous year’s growth, unlike annuals, such as a petunias. Petunias, as an example, usually look tired or worn out by the end of August. I’m not saying annuals don’t rock in container gardens because they do and they are a must have – but people often overlook the values and bonuses of using perennials in container gardens and only consider them for the gardens of the ground. Some perennials are aggressive spreaders in gardens, but when used in container gardens, they turn into stars. 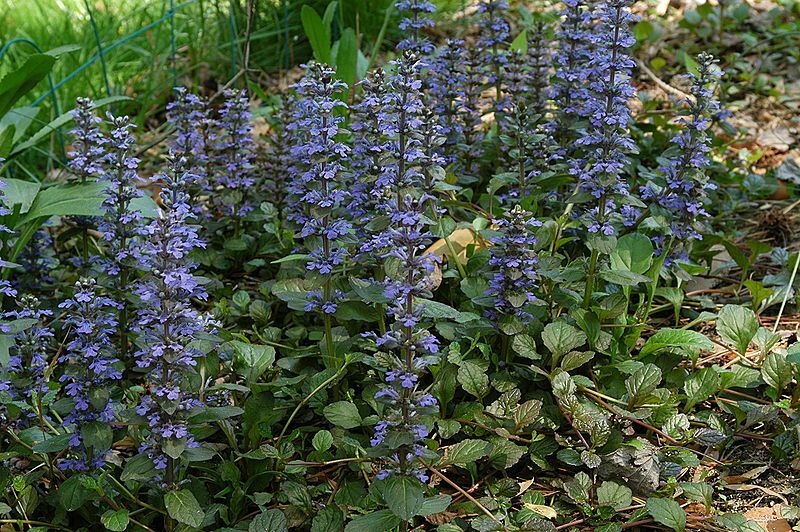 An example is the perennial, Ajuga reptans, also by the common name of bugleweed. You may know this one too. In the spring time, this low growing, ground cover looking perennial spikes up tons of purple flowers in May; they are noticeable. However, they also have a habit of spreading in lawns – which is a nuisance. This perennial actually travels from one spot to the next underground – so folks who desire perfect lawns dislike this plant. Ajuga reptans in a small pot packs a lot of punch – Just Adorable!! In a container garden, however, the spreading issue of Ajuga is eliminated and controlled. Because it is a tenacious plant, it will return in a container garden for several years however – the problem aspect is now a solution in container gardens and patio pots; it shines during the growing season with various foliage colors and tidy habit serving as an exception filler in container gardens with other mixed arrangements. Image: Wikipedia/EnLorax – Ajuga in the ground – shows the blooms, which are so pretty in a container! Ajuga reptans is just one of the many examples of perennials which can be vigorous or quick spreaders in the ground, but is not a problem in a container. The flush of purple color from its blooms is beautiful in a container especially when combined with other spring colored plants like the soft yellow of daffodils or pinks of tulips. 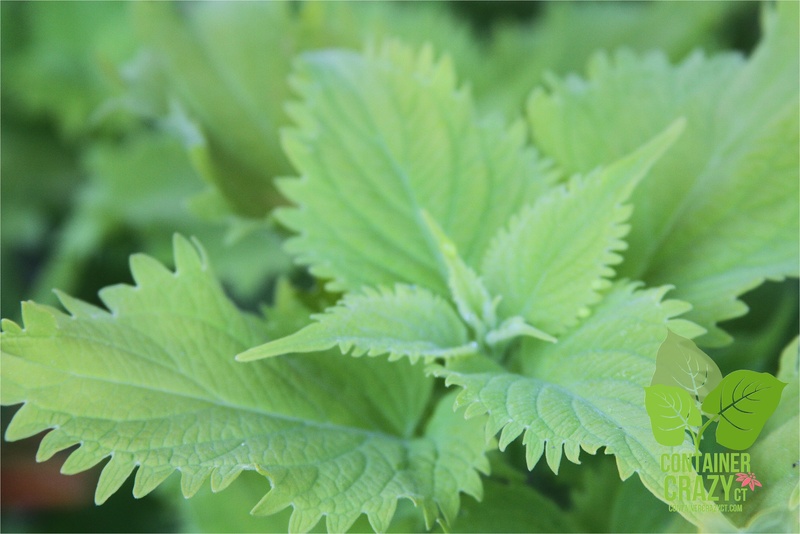 Or it can serve as a very long lasting foliage feature in your container gardens, and this perennial doesn’t get lots of problems. For this upcoming Container Garden Workshop in May 2015, two cultivars of Ajuga reptans: ‘Burgundy Glow’ and Ajuga ‘Chocolate Chip’ will be available for purchase along with many other wonderful perennial plants. Both of these cultivars I have used in containers and patio pots with wonderful results. ‘Burgundy Glow’ has white, pink and purple variegation on its leaves with 6” spikes of blue flowers in May, and ‘Chocolate Chip’ has intense violet-blue spikes rising 3” above miniature, vibrant, chocolate-hued foliage in May through June. One year, I used ‘Chocolate Chip’ in a little container and it was so pretty, and this one can take shady conditions too. You may not think of ornamental grasses or grass like perennials as container garden plants but two of these which I can name right off the bat are Hakonechloa macra ‘All Gold’ and its counter opposite in regards to color is Liriope muscari ‘Big Blue’. 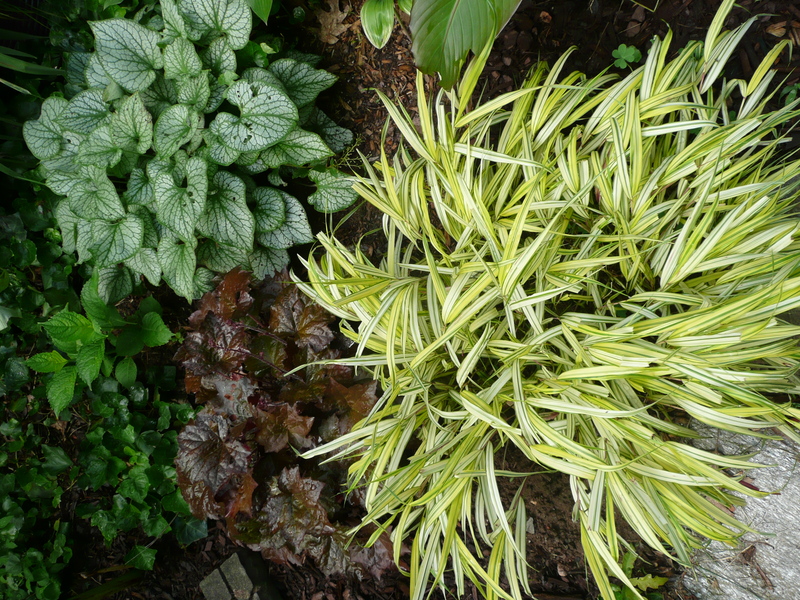 Hakonechloa macra ‘Aureola’ on right – Similar to ‘All Gold’ but All Gold is well – all gold! Hakonechloa macra ‘All Gold’ is one of many hakon grasses I selected for this workshop because it has stunning gold blades of foliage that grows in graceful clumps and the color is intense and vivid. Take that intense vivid color and put it next to the right color bloom of another perennial – and voila – you have eye magic or eye candy. Then there’s Lirope muscari ‘Big Blue’, the polar opposite in color compared to the hakon grass – it has a dark green long strap-like leaves – and it is not an ornamental grass but a perennial, so it, like ornamental grasses, it returns year after year and is tough too. Lily turf is Lirope’s common name, and it can be used to cover lots of turf – because it does spread – so this one fits my “Troublemaker Turned Star” scenarios for container gardens. It is a strong grower which is a problem in landscape situations, but it makes a wonderful low height type thriller with 15-18” long leaves with violet flower spikes in late summer in containers and patio pots! I’ve used Lirope in containers and it comes back every single year – it’s tough! This enables me to reuse it and just add new supporting candidates with it in the pot every season. 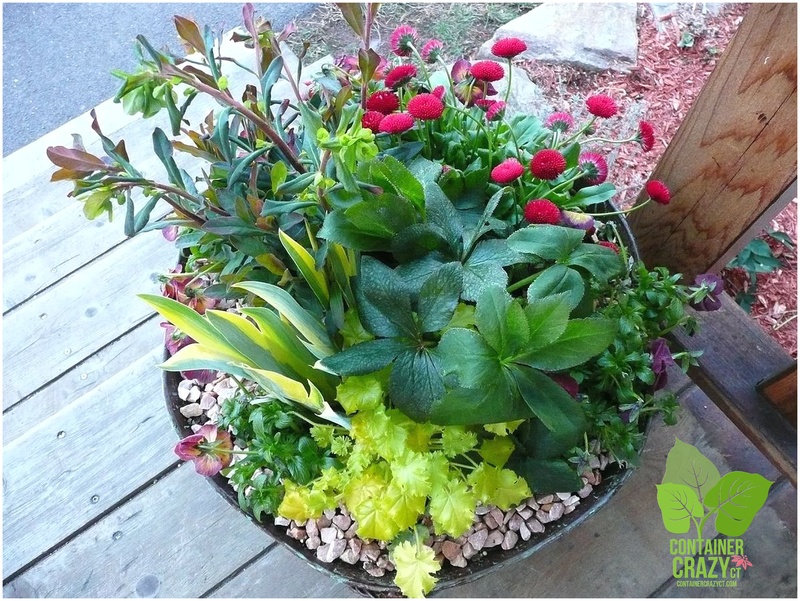 Container Garden with Perennials: Heuchera, Hellebore, Bellis perennis, Euphorbia in early Spring! There are other wonderful benefits to using perennials in your pots – Again, they return, as mentioned above, for at least three or more years – so this saves you money; they may be transplanted into your gardens or yard after the summer season is over in the fall, so you will enjoy them for years to come; and they give a dynamic bloom period or show at specific times in your container gardens. This gives your container a living interest because suddenly, in the midst of summer, a burst of a new color opens in the blooms of a perennial in the container, or perhaps it is an early spring bloomer or late bloomer in the fall – either way, it adds a new interest for you to enjoy and view. It is the ta-da of container gardening. Perennials also serve lots of other wonderful purposes. They have fragrant foliage and flowers, many can be used as a cut flower for your vases, and they attract butterflies and bees – and others have medicinal purposes too. 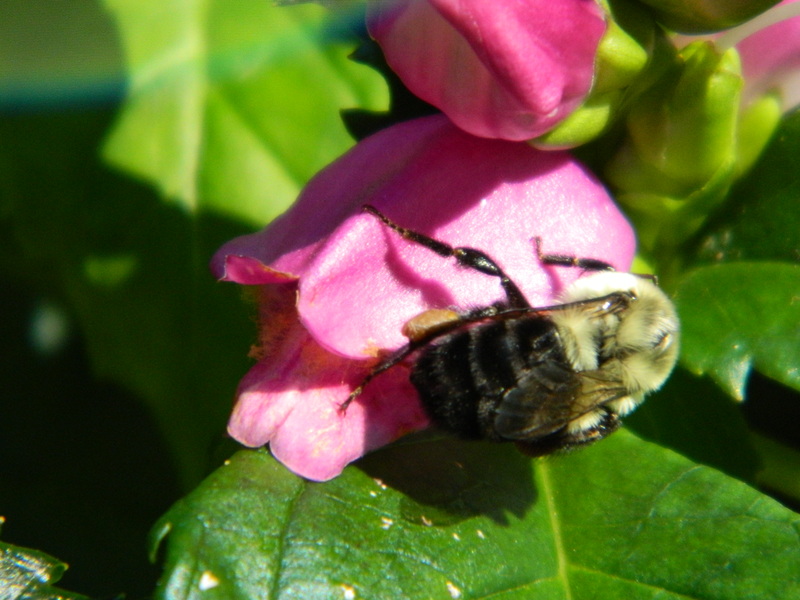 Bee enjoys a perennial (Turtlehead) – A late season bloomer and very showy plant in containers! There will be varieties for sun and shade available at these two workshops in May 2015. A total of 120 perennial plants have been ordered, 6 each of 23 species. Learning their features and how to use them with other plants in the containers will be part of this workshops offerings. 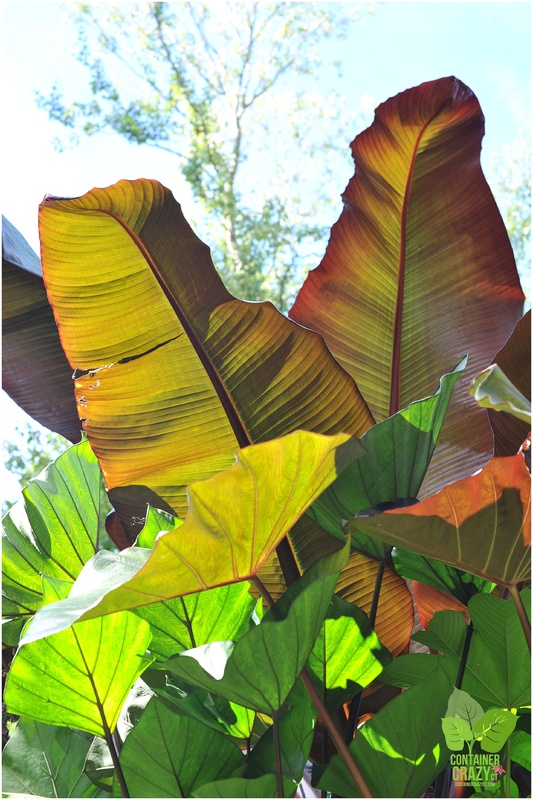 Red Banana Leaves with Various Elephant Ears – The Type of Tropical Plants Available at the May Workshops! Tropical plants with large lush foliage features will be part of the Container Garden Workshops this year as well – because they are a passion and, like perennials, they have great benefits – the ability to reuse them year after year when appropriately stored over the winter, their dramatic and showy role due to their ability to grow fast, and adaptability to warm climates, which is what we have here in CT during the summer months. Many tropical will last all the way into October with no signs of stress, giving you a real show until the first frost of fall arrives. 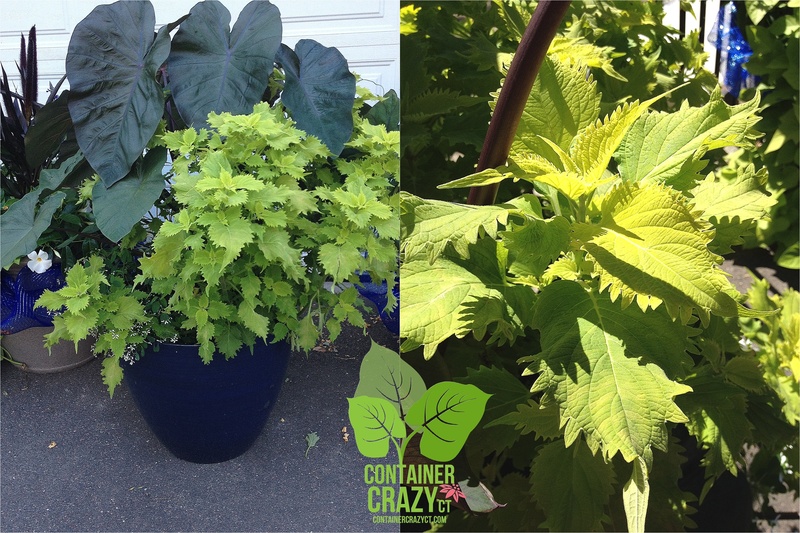 Containers in Sept 2015 shows the thriller of Colocasias (Elephant Ears) – Available for Purchase at the Workshops! Every year, elephant ears (Colocasia), banana plants (Ensete and Musa), and some other unique tropical plants are offered as part of this workshop. 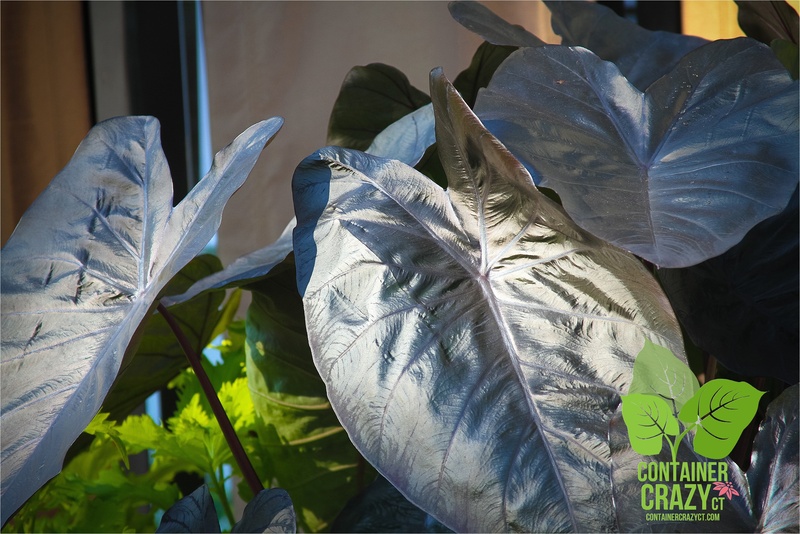 Pairing up a dark toned elephant ear, such as Colocasia ‘Maui Magic’ with a vivid bloom of a perennial has dramatic effects in containers, and in this workshop you will see how it’s done. A total of 185 tropical plants have been ordered, 8 each of 21 species, and learning their features and how to use them with other plants in the containers will be part of this workshops offerings. Start visiting my pinboard titled, Perennials with Power for Container Gardens, to get a glimpse of what the featured perennials and tropical plants will be at the Container Garden Workshops scheduled on May 16th and May 23rd, 2015. I will be adding photos up until the workshop dates. This will give you an idea of what will be featured, and some are shown in container gardens and patio pots too. This year, the workshop is being offered on two dates. There are some considerations beyond your calendar’s availability on which date you may want to select. Both sessions will have the same topics and materials available. More details of what is included in the class is listed on www.ContainerCrazyCT.com, click MAY CLASS (BIG CONTAINER GARDEN) under the Nature with Art Programs menu. The May 16th date is after our typical spring frost date but we won’t know until we hit April. Experts say we are “almost guaranteed” to not get frost from May 10th through September 26th, but after our winter and global changes – do we trust weather guarantees anymore? This means if you elect to attend session no. 1 on May 16th, your containers may require protection if we get an overnight frost. Frost is not as harsh to perennials, but will affect tropicals. If you are okay with moving your pot or covering it with a light sheet if forcasters say we will get a frosting, then May 16th is for you. The May 23rd date will be safe – however, it is Memorial Day weekend, and schedules tend to be busy – but with that said, nothing is better than placing your newly arranged container garden out on your deck or patio just in time for the festivities. Visit the Facebook page for Container Crazy CT and click on EVENTS to join. Complete the Contact Form found at the bottom of the class pages from the top-menu bars of http://www.ContainerCrazyCT.com. $15 per person + cost of plants purchased at the class. Payment of class fee of $15 is required by mail one month prior to the class date. Payment is non-refundable for any cancellations one week prior to the class date. Sales tax is applicable on all plant purchases during the class. 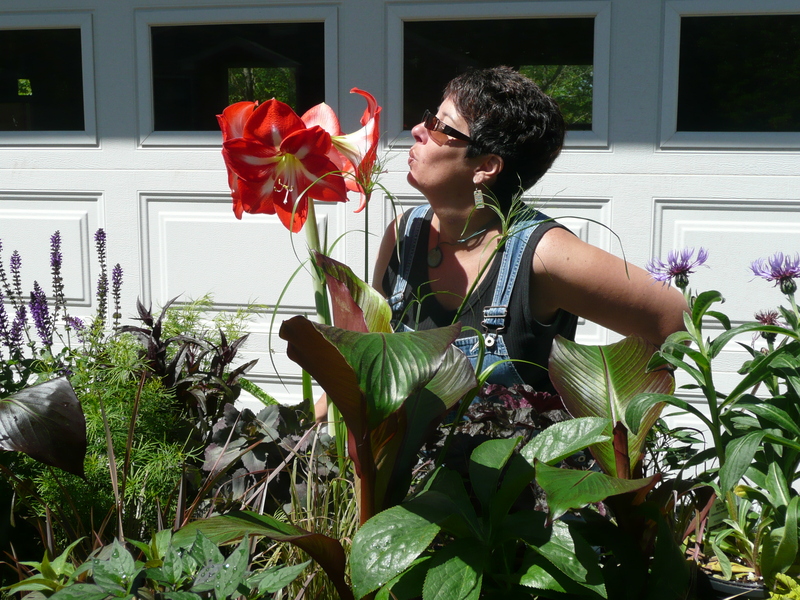 Cathy Testa is a container garden designer in Broad Brook, CT. 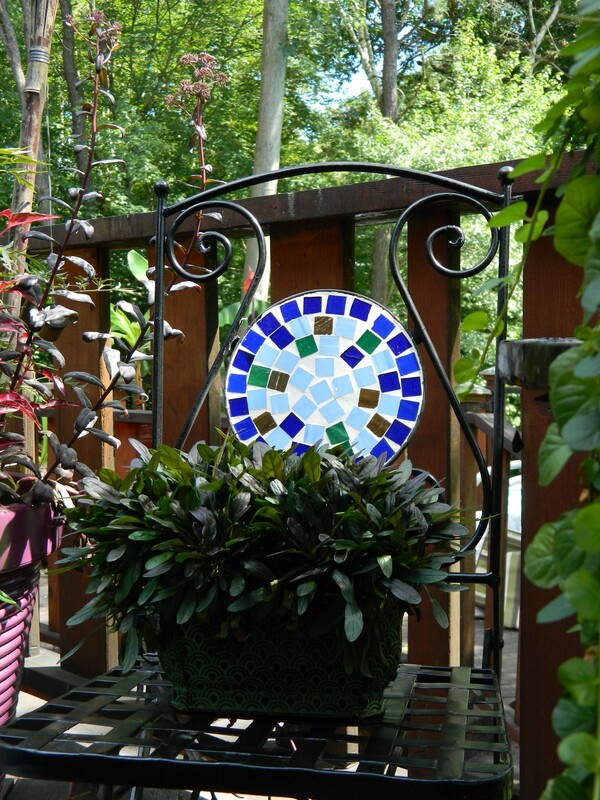 Her work has been featured on the television program, CT Style, and in several gardening publications. 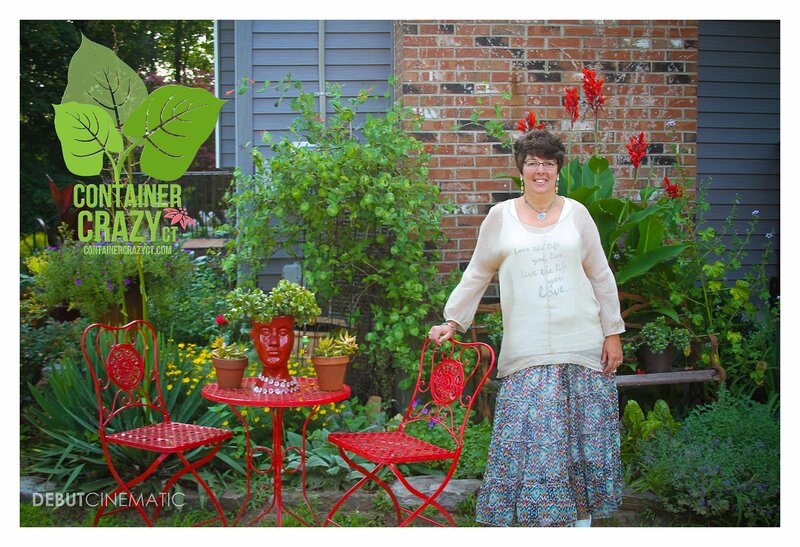 She offers classes year round where nature is combined with art and is available for container garden installations. For a Calendar of All Events and Workshops, click HERE. 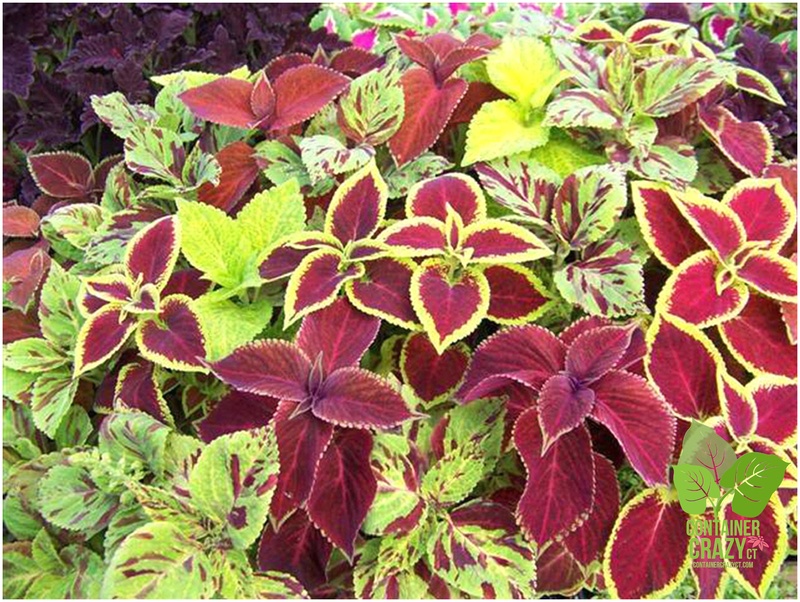 When it comes to a wide array of foliage colors, coleus plants are one of the best to use. It is no wonder the National Garden Bureau has declared 2015 the Year of the Coleus. Just look at this image below, downloaded from the bureau’s website (www.ngb.org/downloads). The variegation is speckled, trimmed on the edges, and splashy! And this plant is so easy to grow. Coleus plants are known for being tough and are quite recognizable by plant lovers. These are just examples of perennials in that color, but many annuals, ornamental grasses, and a few shrubs also show off lime green or chartreuse colors. The plant list could go on and on, but it was important for me to have strong performers and those which would last towards the end of the summer. Two easy plant choices, which I knew from experience would last, were the annual plants, Wasabi coleus and Ipomoea batatas ‘Marguerite’ (sweet potato vine). 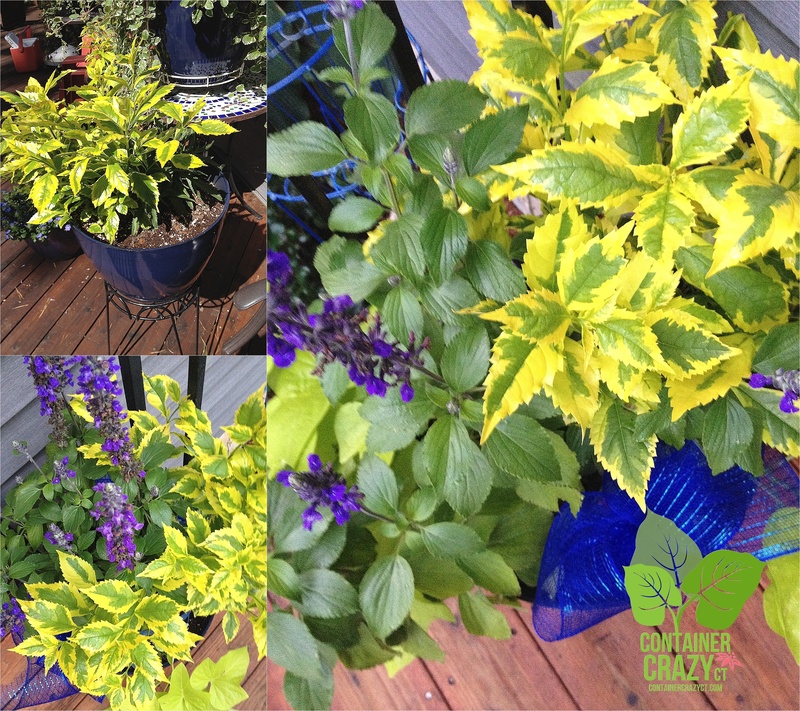 Both plants have bright yellow to lime green foliage and really stand out in container gardens. 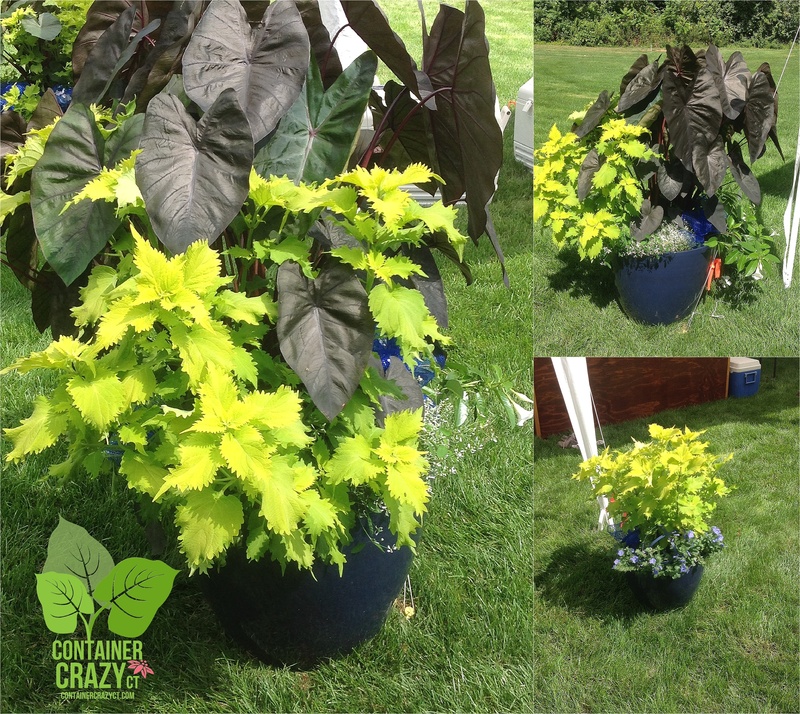 One of the aspects I adore about how Wasabi coleus worked in the container gardens is how its lime green coloring was highlighted or intensified as it sat near the dark toned elephant ear plants in the pots. 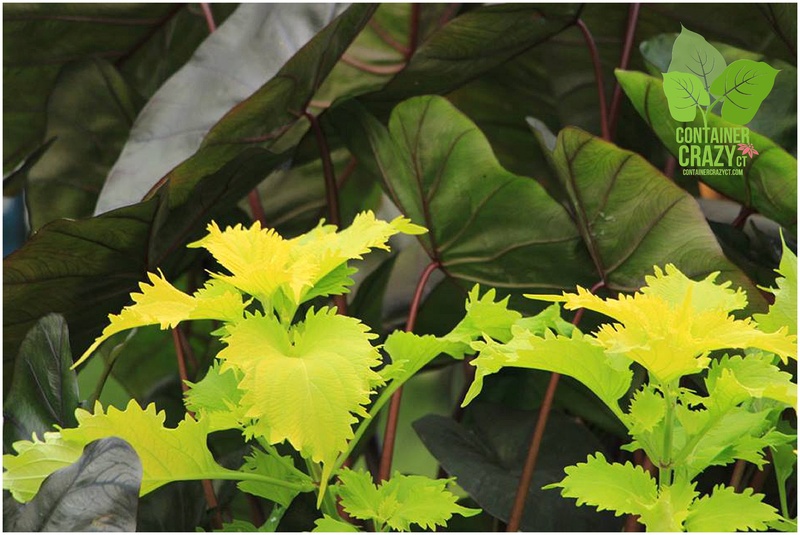 Wasabi Coleus with Dark Toned Elephant Ear Plants – Photo by Patrick C.
For the elephant ears, two varieties were used, Colocasia esculenta ‘Black Magic’ and C. esculenta ‘Black Diamond’. The coleus was so vivid and intense next to the darker toned elephant ears making each plant all the more dramatic. Colocasia esculenta ‘Black Magic’ has to be one of my all time favorite dark toned elephant ears. It has amazing downward facing heart or ear shaped leaves rising from tall plum to purple-black stems and grows to about three to six feet tall. The reason I find them great tropical performers is because the stems cluster and rise in a nice full batch from the center, and they stay tidy but are very lush and full, serving a the main thriller plant in the container gardens. 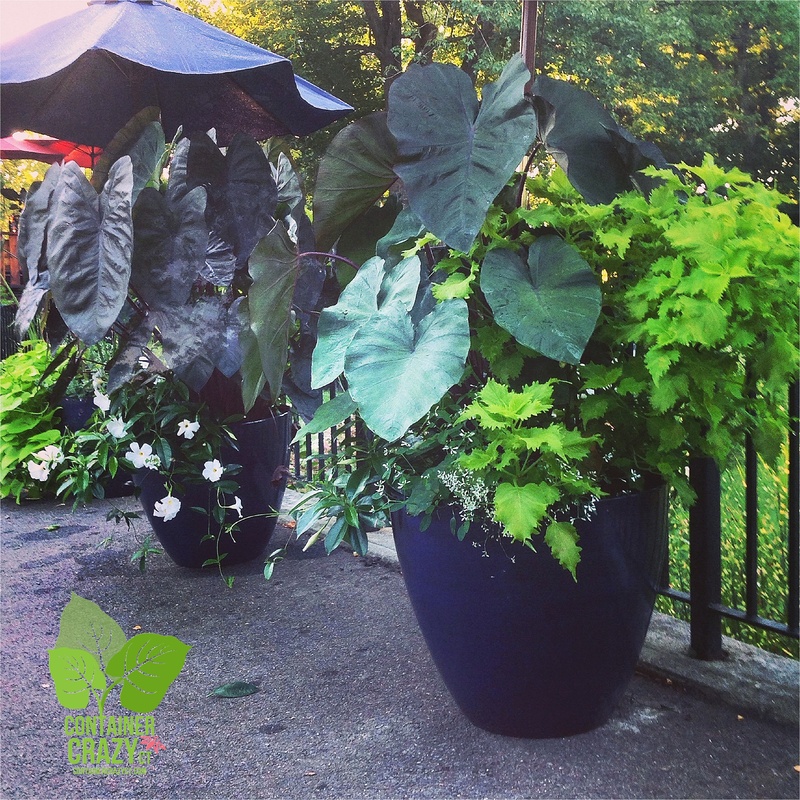 Coleus has strong stems which helps it to stand upright in the container as a filler plant next to the elephant ears. However, those strong stems may break in windy situations or if bumped up against. But, the good news is with a quick snip to any damaged stems, regrowth bounces back nicely. Wasabi coleus does not tend to send out blooms, so I did not have to deal with cleaning them up. 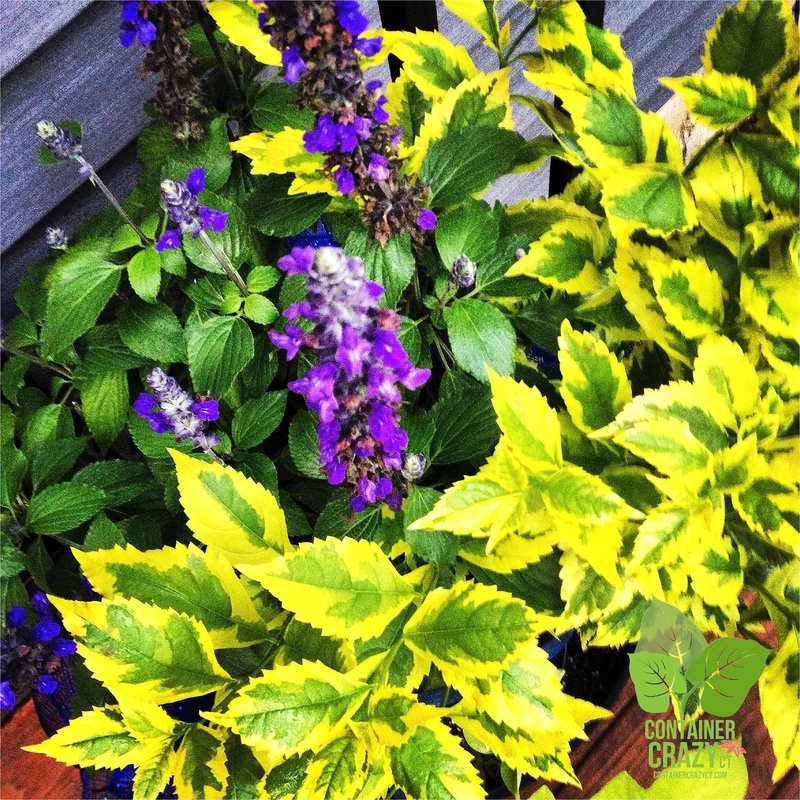 From the time I planted them in the containers until the point it was time to tear them out, there was not a flower in sight which to me was a good thing because I prefer the foliage colors and textures of coleus plants – the flowers are not that intriguing to me. In fact, I experienced no problems with Wasabi coleus. No blemishes, no spots, thus no worries. It was an excellent specimen from beginning to end. The lime green to chartreuse color of this annual plant served to meet the client’s desired colors, and provided a nice texture with its heavily serrated edges, plus it grew upright and tall, filling in nicely alongside of the other plants in the container. However, there were a couple other plants incorporated into the pots with similar lime-green coloring. Another plant, which is not a perennial but annual in our CT planting zones with lime green appeal, is Duranta serratifolia (Sky Flower Tala Blanco ‘Gold Edge’). This species is a shrub and its vivid lime green to bright yellow foliage with green centers is extremely electric. The coloring is very bright and the plant is tough. The only concern is handling it because stems have sharp spines, but otherwise, it definitely adds flare to the containers. As noted above, cobalt blue was another color requested, and this plant made the blue to purple flowers in the pots pop. 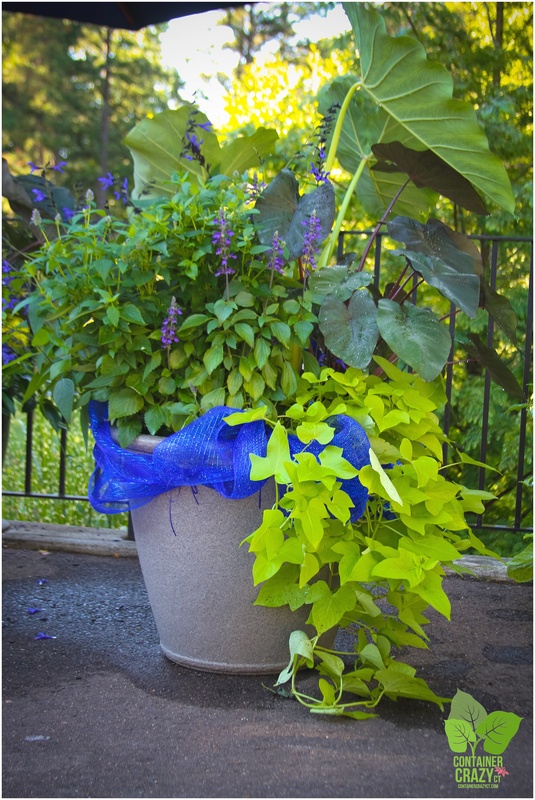 You don’t even need to say or mention why sweet potato vines are excellent for container gardens. They trail, grow relatively fast, and are showy in pots. Pretty much everyone into gardening knows of them – similar to how gardeners are aware of coleus plants. This is why the ‘Marguerite’ sweet potato vine was used as the spiller, a plant which trails off the sides in the container gardens. It has a nearly perfect lime green color and grows quickly. The sweet potato vine plant eventually grew so long, I had to pick them up in my arms when moving the pots into my trailer for delivery. It felt like I was holding the train of a wedding gown. Ipomoeas are sun to part shade annuals. They are very versatile in any type of container gardens from hanging baskets to window boxes. Sweet potato vines could be considered the staple of spillers because they cascade so nicely and keep growing. The container gardens at the wedding event served more purposes than just dressing up the space, they were great for protecting guests from tripping over the tent cords. 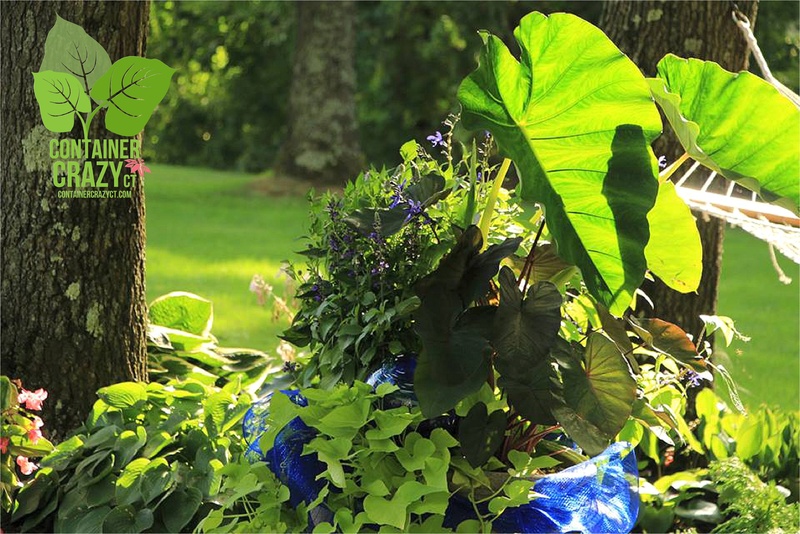 And the bright lime to yellow green of the three plants (Wasabi coleus, Marguerite sweet potato vine, and Sky Flower) seemed to glow at dusk as the wedding day progressed which turned out to be beneficial. After the container gardens were returned to my nursery, because they were obtained as rentals by the bride and groom, they continued to show their beauty until the early days of fall. 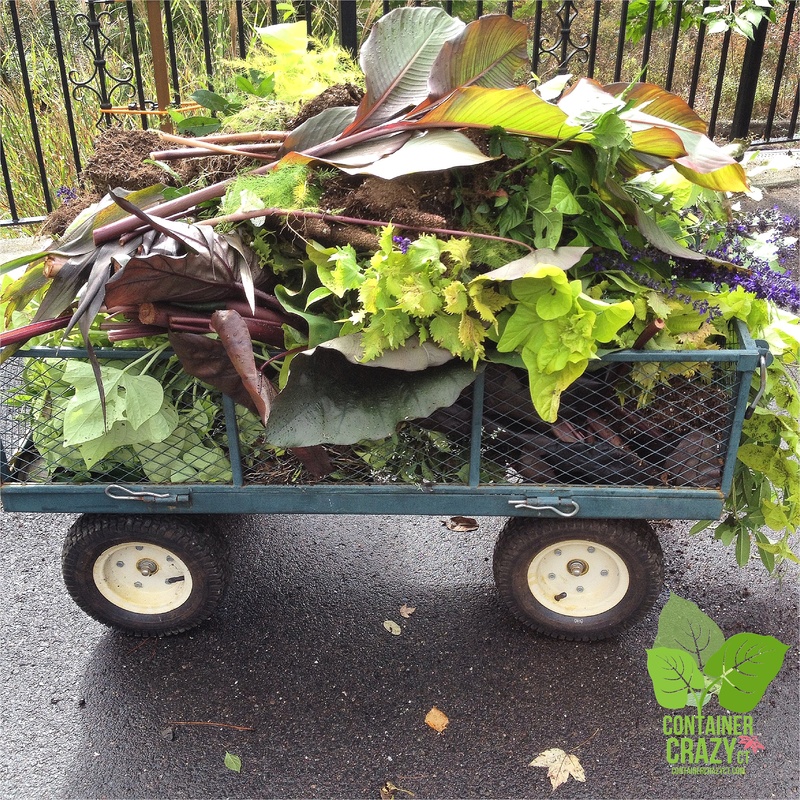 When the season was over, I piled the stalks and cuttings of the plants into a garden cart to compost. Even here, you can see how amazing the bright lime greens showed up in the pile of mixed plants removed from the containers. By the way, many people view coleus as a shade plant, but it can take part sun or dappled sun. Coleus ‘Wasabi’ was a great filler in these container gardens, but many other varieties tend to cascade downwards, serving as what I’ve titled as a “sprawler”. Sprawlers are similar to spillers, except they reach out a bit like arms coming down or reaching out of a pot. 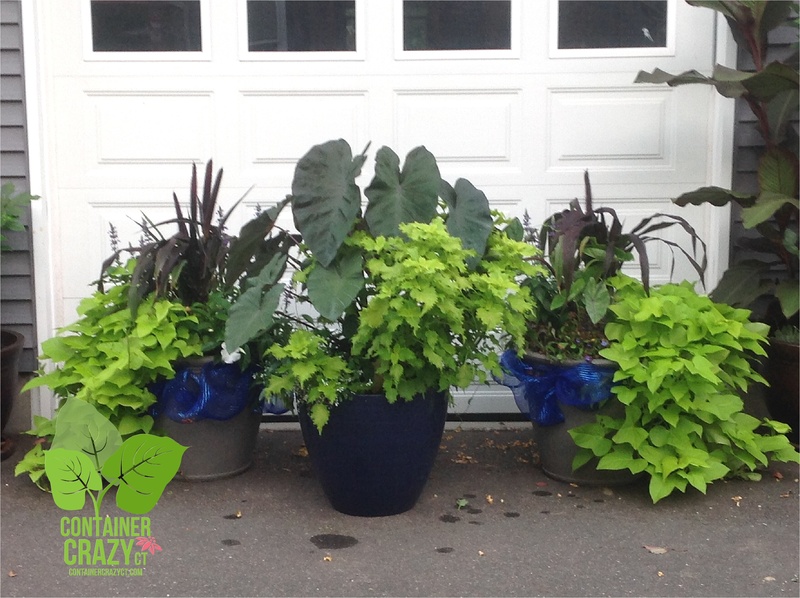 Also, big plants, like the elephant ears used in this combination, provide some shade over the lower growing coleus plants. One sprawler which comes in mind is Coleus ‘Dipt in Wine’. It has a red wine color. One year when I used it in a container garden, it gently moved its way outward and downward from the pot. And…well, I could go on and on about coleus plants, so I should stop here. Saying “The Year of 2015” is the “Year of Coleus” seems a little silly because it has always been a yearly choice for me. For more details about how to grow and care for coleus, visit the National Garden Bureau page. P.S. Only 15 days until spring! This situation just happened the other day. I was chatting with someone I’ve known for several years, and she asked if I was into banana plants? This question was a surprise to hear because I’ve blogged about them, sold them, and especially like tropical plants. Before I could answer, she started to tell me how she was growing some in her home for a garden club event. As soon as I started to tell her about the big red banana plant I grew in a large planter a couple years back, she paused to listen. This discussion reminded me of how I once told a garden center owner that many of my friends were not aware their store existed. He kind of listened but I don’t think he believe me – because they are well established. First – A little bit about my style. I tend to like showy foliage plants, and big tropical plants because they are exciting and grow fast in container gardens. I enjoy storing tropical plants over the winter months so they may be reused each season as well, so as part of my classes and talks, I often share how to do so – store tender plants. Taking Down a big Red Banana Plant – All Steps are On my Blog!! Storing tender plants (or tropical plants) is something I enjoy. 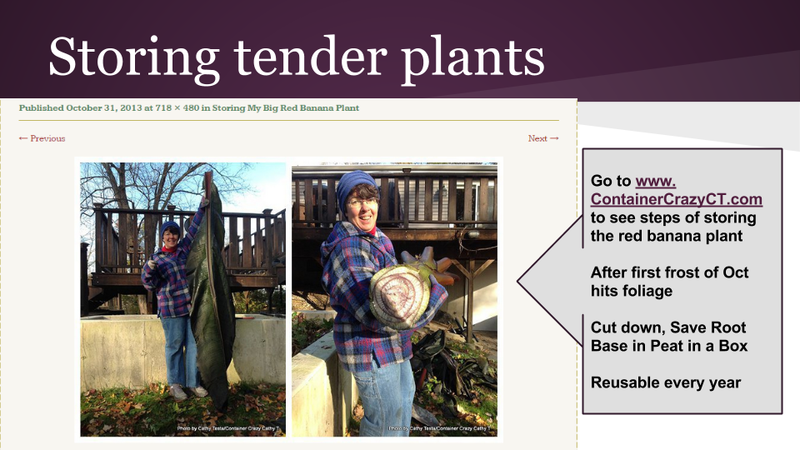 On my blog — this blog, you will find prior posts which show how I do this – The photo above, from a prior blog post, shows me holding a 7 foot long leaf of a red banana plant (Ensete) and the trunk after it was chopped down following an October frost two years ago. It was amazing how this plant grew that particular year in a very large cement planter. As you can see, in these two photos above – the red banana plant grew to about 12′ – 14′ feet tall! I was so in love with how lush and tropical it looked, I kept taking photos of it. So, my style is kind of like that above; I like to create outdoor oasis like places in my surroundings, where you escape to a feeling of the tropics. And I tend to enjoy using unusual plants, like cool looking edibles in container gardens. 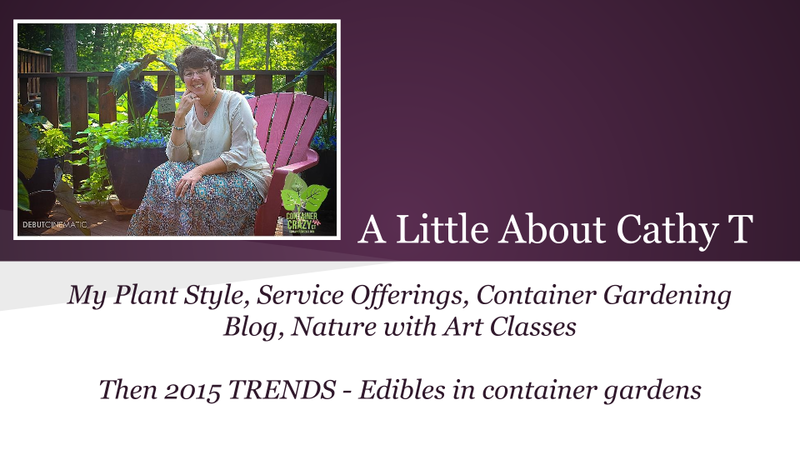 I spoke about edibles quite a bit last season at garden clubs and farmers markets. Container gardening or arranging plants in patio pots is my favorite thing to do and offer as part of my services offerings. I’m a small business located in the Broad Brook section of East Windsor, CT.
Store front seasonal container arrangements, such as various plants in spring, summer, and fall – and then changing them out for winter displays with fresh evergreens, and even fun off-season decor for the holidays is what I offer to local store front type businesses. This dresses up the store front, welcomes customers, and even encourages friendly communications with your visiting clients. 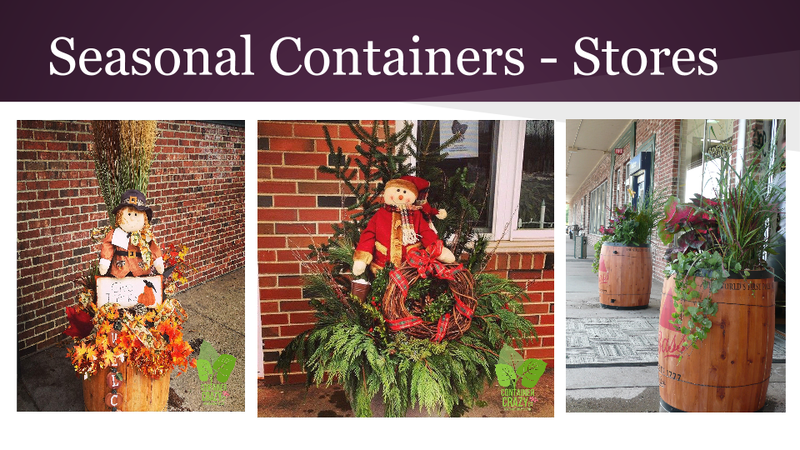 For referrals or more information about the container garden installations, feel free to contact me or complete the Contact Form at the bottom of this blog post. Or click on Testimonials above on this blog’s menu bar. I also offer container garden installations at homes. 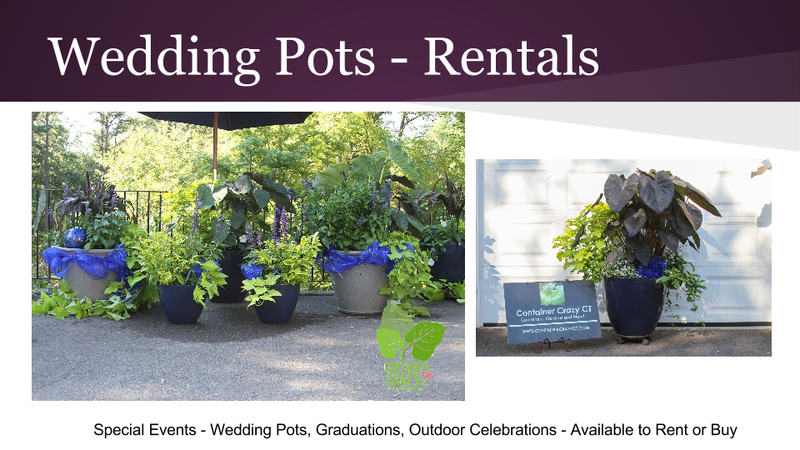 And for special outdoor events, such as weddings, graduations, or any type of special celebrations at your home. 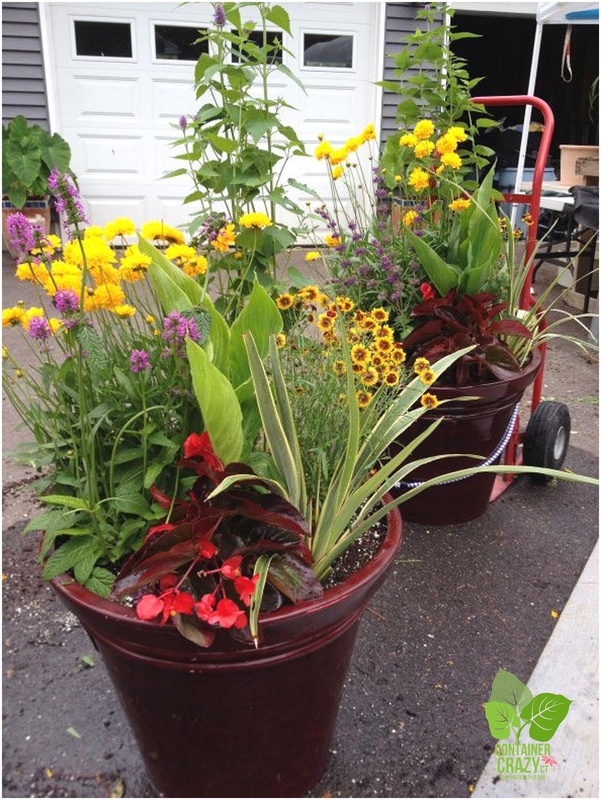 The container gardens filled with lush plants are available for purchase or rent. To read about my Container Garden Services, click HERE. Consider this alternative of enhancing your outdoor space with container gardens filled with beautiful plants the next time you are throwing a special party or event. After all, container gardens are enjoyed for months to follow in season, and are long-lasting compared to other outdoor decor which is there just for the day – and never to be seen again. 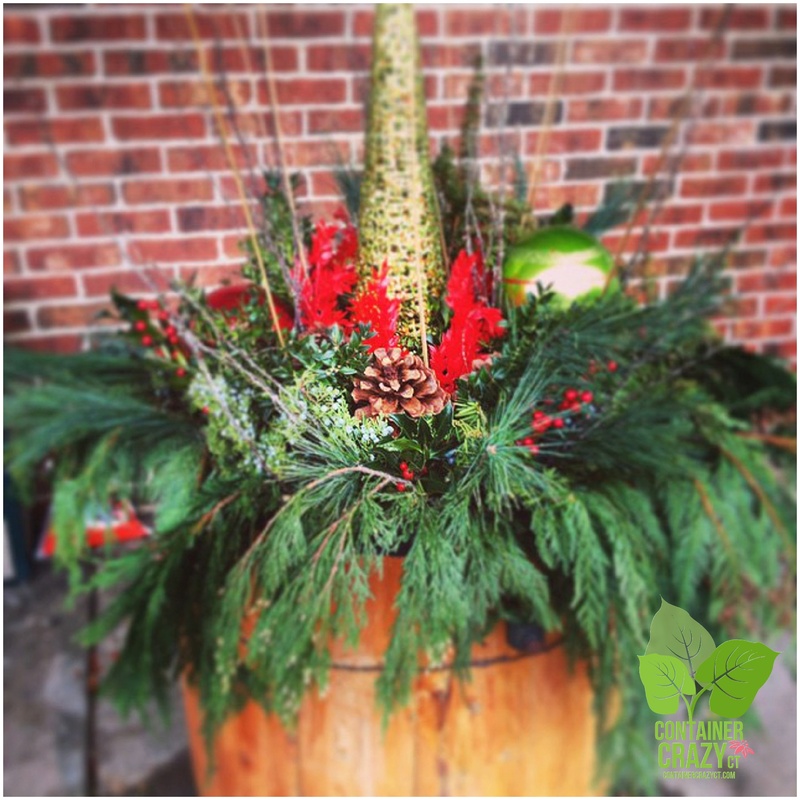 Containers make wonderful gifts and decor for events. For more information, contact me or fill out the Contact Form at the bottom of this blog. It is important to plan early and in advance for special events. Fun gatherings where attendees learn hands-on is another service offering by my business. 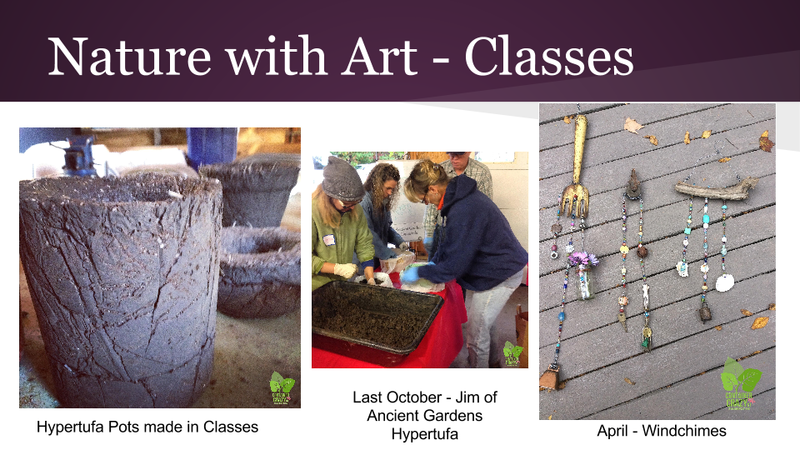 It started with offering classes in the winter months, and transitioned to workshops on container gardening and other classes related to combining Nature with Art. Last fall, we had a special guest speaker come in to teach us how to make hypertufa pots, and this spring, we will be making eclectic windchimes. The topics vary but they all focus on combining nature with art. The 2015 class schedule is posted above – via the menu bars – on this blog. Click on CALENDAR to see the upcoming events by month. First on the 2015 list is an April class on making eclectic windchimes. 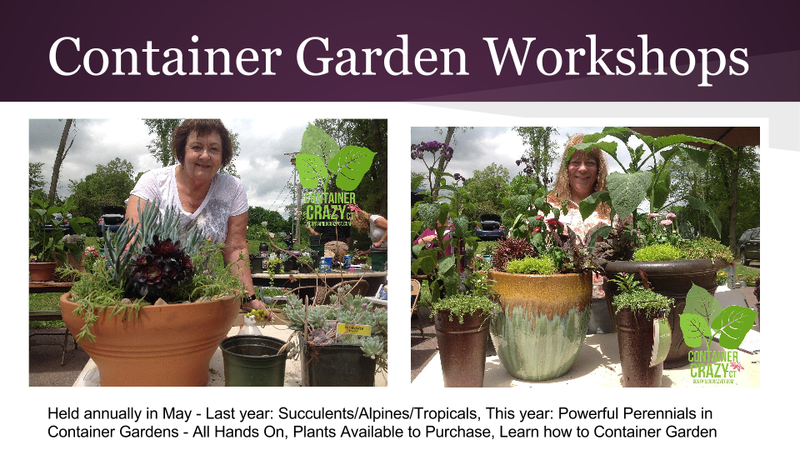 And every May, a Container Garden Workshop is offered. This year’s theme is, “Powerful Perennials in Container Gardens.” To see the complete class listings, please click on the menu bars of this blog and look over the drop down menus by month. Sign up is via the contact forms on the blog pages. The workshops are held in Broad Brook, CT. They are convenient, educational, and a great way to network with other gardening friends. But most of all, they are fun! 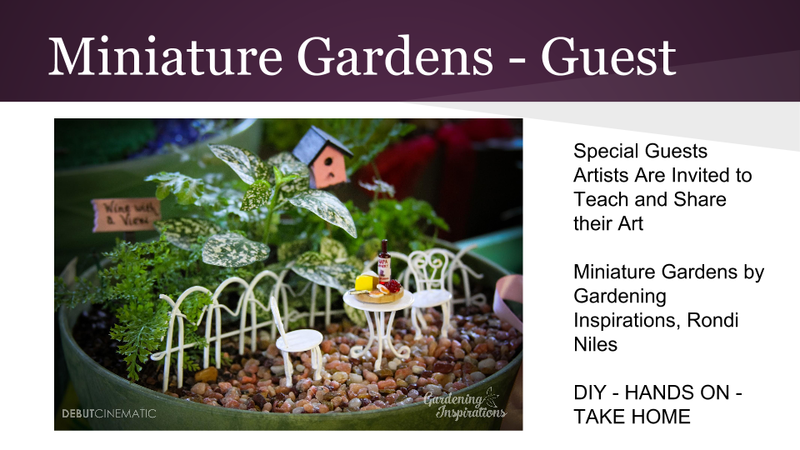 Last year, we held two sessions on Miniature Gardens with special guest speaker, Rondi Niles of Gardening Inspirations – it was held twice because everyone enjoyed them. This year, the Container Garden Workshops will be held twice as well. I hope you will join us and share the events with your gardening friends. In the warm season months, classes are held outdoors. During the winter, inside a classroom. 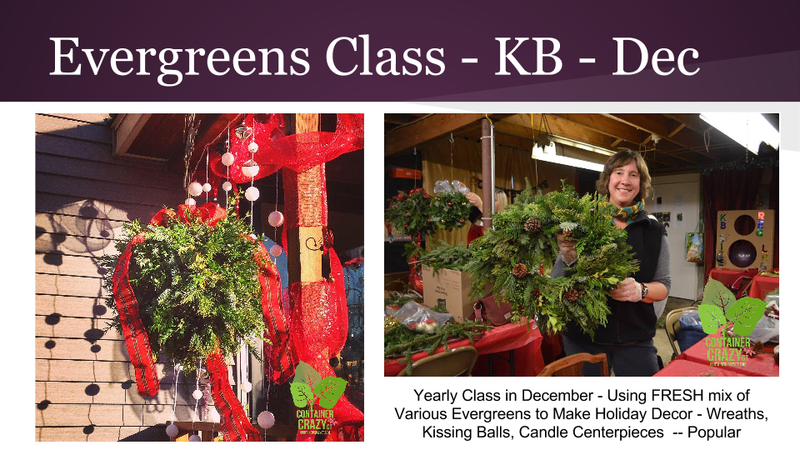 Every December, I offer a class on working with evergreen plants to create amazing holiday decor, such as evergreen kissing balls, wreaths, and candle centerpieces. It fills up fast and is an event everyone enjoys as well – organizing groups is one of my passions – and is a great way to network and meet new gardening friends, or those who enjoy creating and making items for their home’s outdoor surroundings. And last year, a new activity was added to the Cathy T’s offerings – Walk and Talk Home Gardens tours – Very informal, fun, and the hosts are homeowners willing to share what they have done in their gardens – with the rule that there “are no rules!” It can be informal, messy, or amazing – it is a way to share and learn from each other. 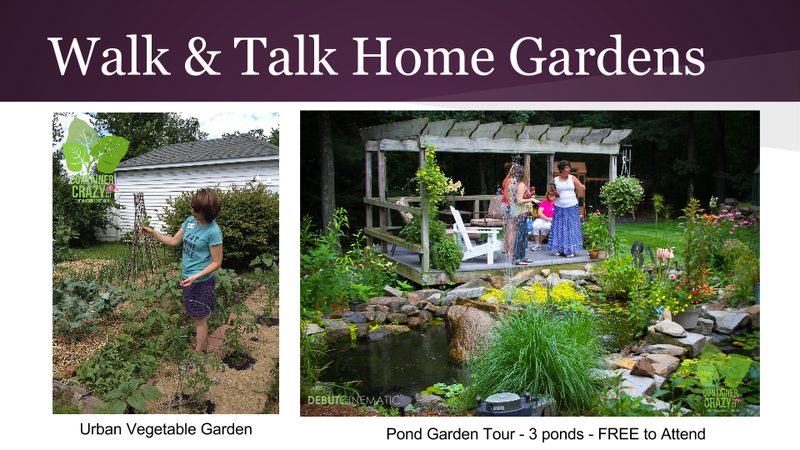 Last year, we toured a pond garden in Enfield, an urban veggie garden in Wethersfield, and a sunny hillside garden in East Granby. The Walk and Talk Home Garden Tours for 2015 are underway. We have two lined up so far for 2015. Again, see the menu bar with drop down menus of all the activity. If you are interested in sharing your home garden, please reach out – it is a great way to exchange gardening tips, meet new gardening friends, and share what you know, how you have created a garden in your special spaces, and it doesn’t matter if your garden is big or small, perfect or imperfect – we want to hear from you! To contact me about a tour, e-mail containercathy@gmail.com or fill out the Contact Form at the end of this post. 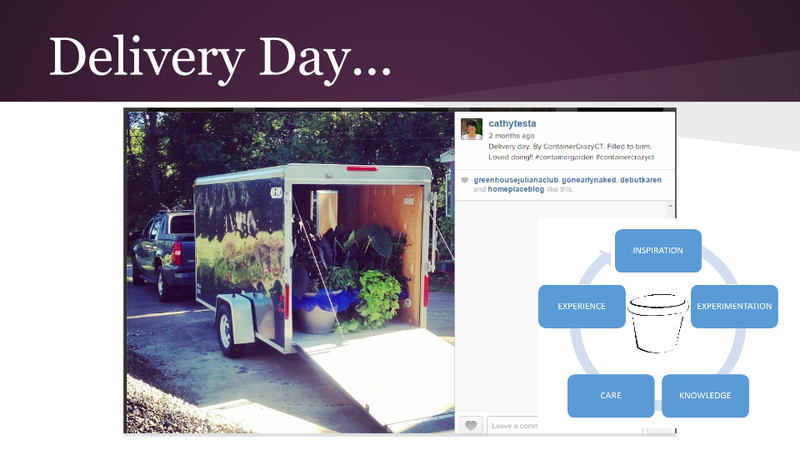 So there you have it – in a nutshell: Container Garden installs for homes, businesses, and special events. Lots of nature and plant related classes which are all DIY and include taking home your creation – and educational! 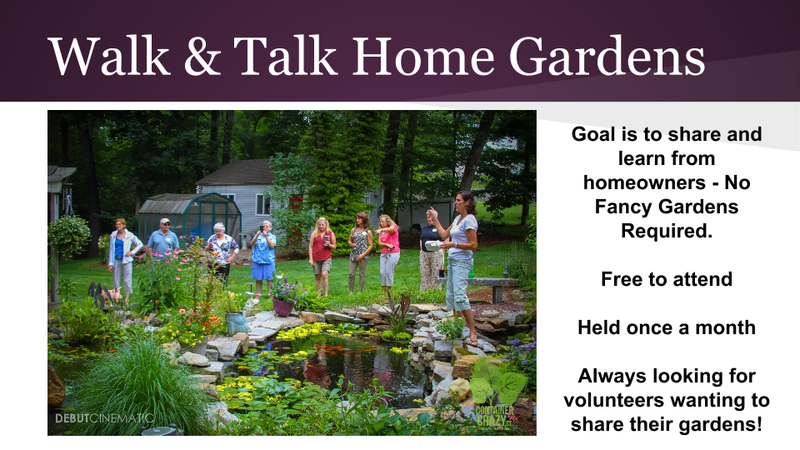 And Garden Talks at Garden Clubs, appearances at farmers markets (Ellington and East Windsor again in 2015), Garden Tours at People’s Homes, and more. My business is based on 8+ years of growing from my inspiration and passion of plants and container gardens, experimentation which lead to knowledge and taking courses over the years, and knowing the right way to care for plants in container gardens and patio pots, circling back to more experience. It starts with having a passion and inspiration! Let’s meet to share the passion together. To learn more about Cathy Testa, see her BIO.